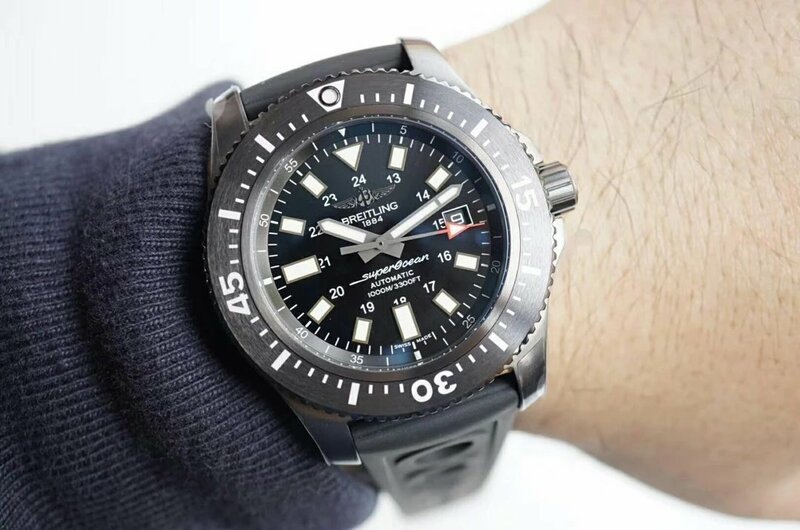 Superocean is a top rated diving watch series of Breitling, I like it very much and BlackSteel here discussed is highly uniform in style. 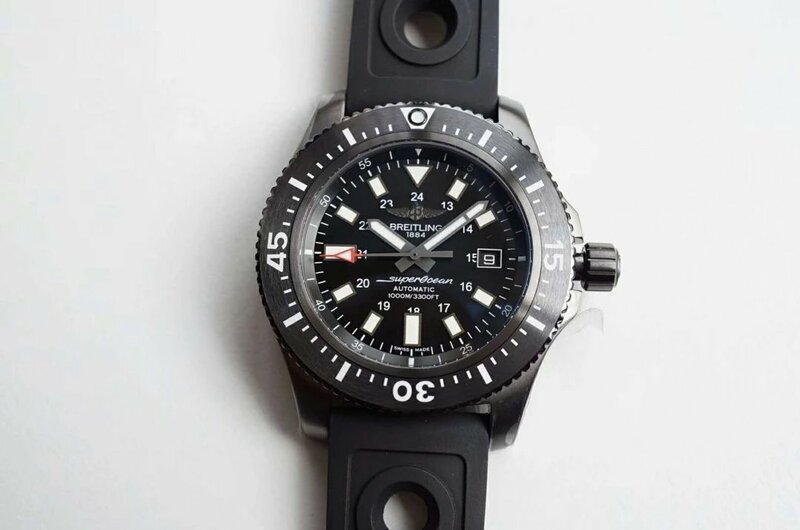 Tough case design, strong dial lume and rubber band are three essential elements as a diver’s watch, the Breitling Superocean 44mm BlackSteel is exactly such type of watch, under cool black appearance, the superlumed dial is just like one pair of bright piercing eyes of black shark squatting in deep sea. 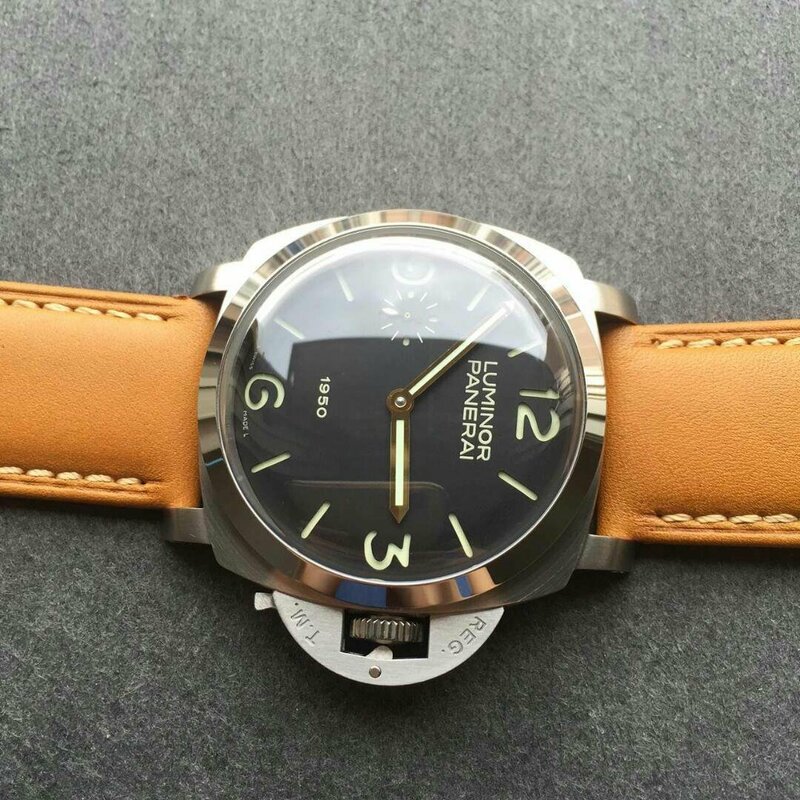 G factory, which we call it GF here, is a great manufacturer that makes good quality GP and U-Boat replica watches. 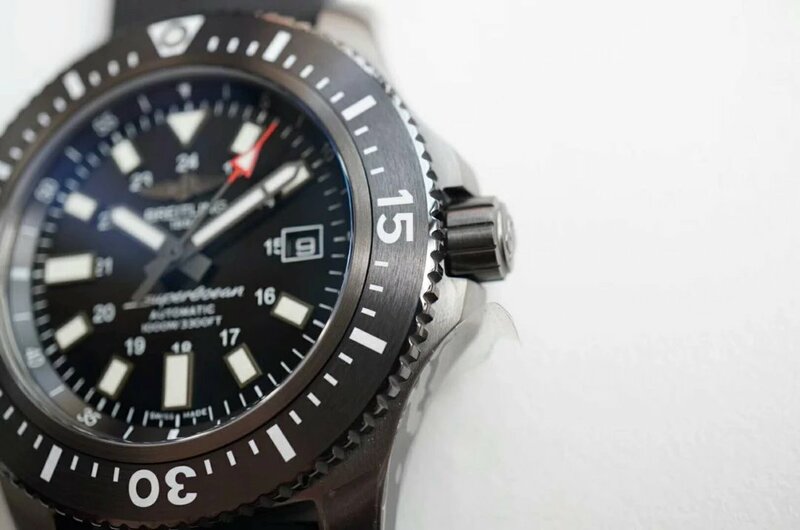 The replica Breitling Superocean 44 is an art work that combines high-tech watch material and skilled watch-making technology. 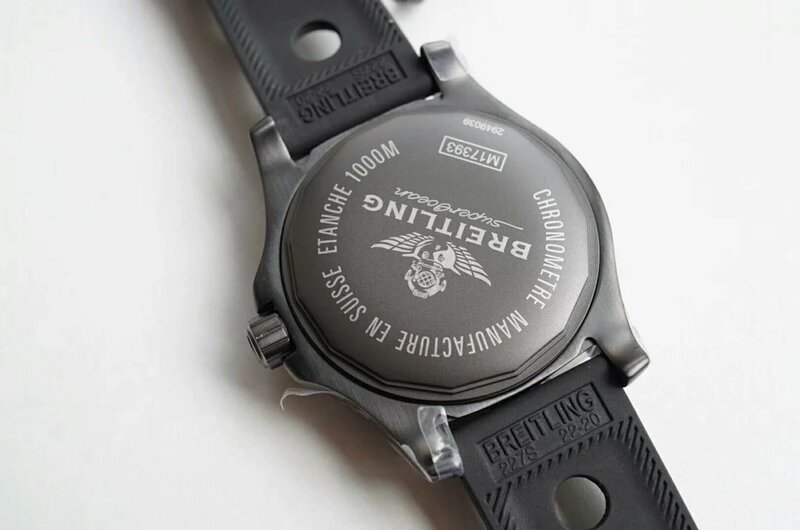 It is a replica that is not only 1:1 copied from original Breitling, but also tested to be 50m waterproof. 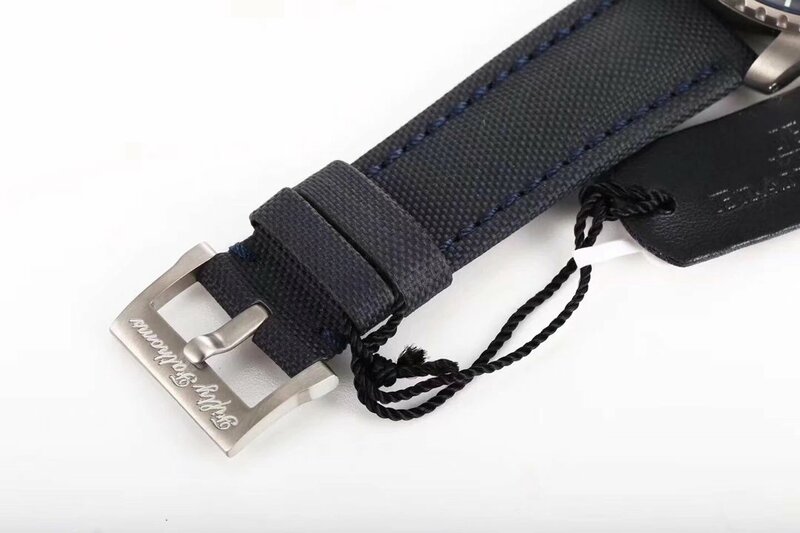 It is not a problem for you to wear it while swimming or diving. Black case is cool. 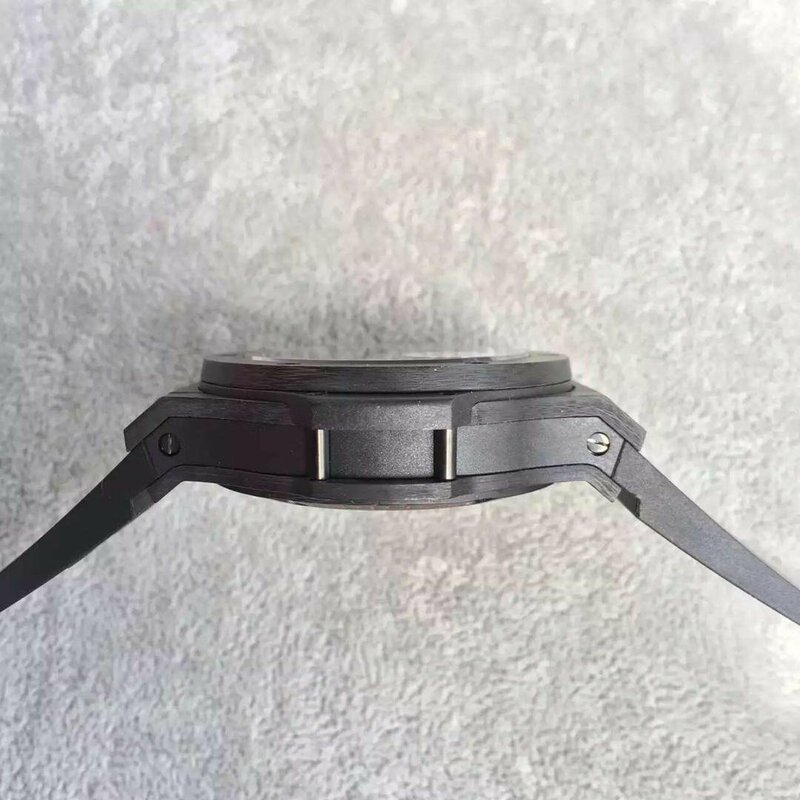 It is made of 316L stainless steel, while the surface is black dlc processed. 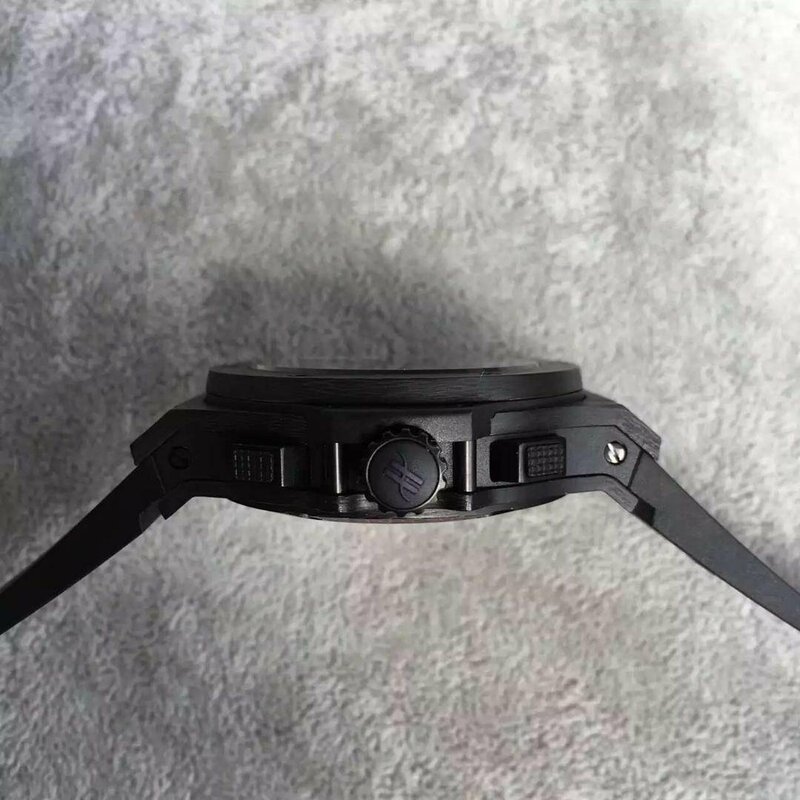 Case is 44mm in diameter and 15mm thick, due to black dlc coating, it looks more durable and tough than other Superocean watches. Being brushed, the case brings a good touch feeling. 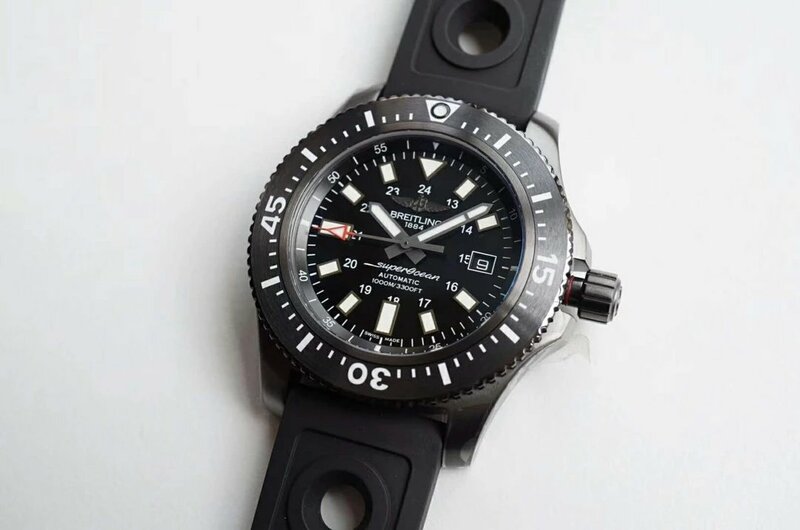 Bezel features a high-tech black ceramic insert that has white diving markers, bezel could be uni-directional rotated. Solid case back is brushed and has delicated engravings, case back is screwed down tightly. Dial is black with white hour markers and printings. 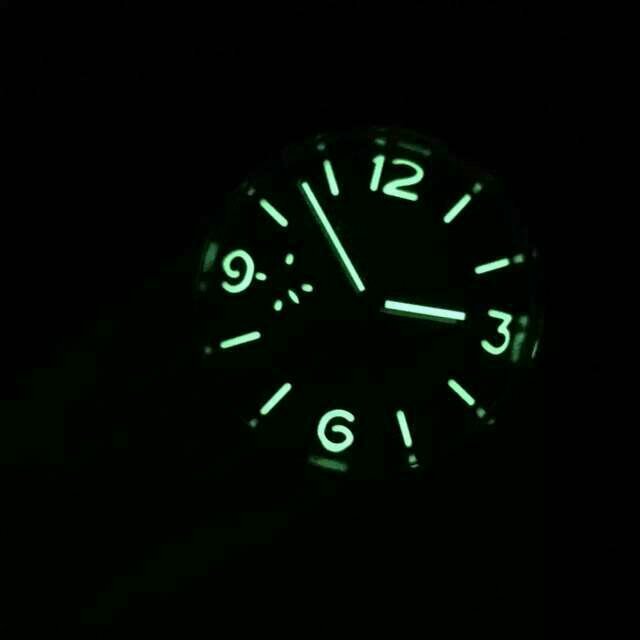 The lume material applied on hour markers and hands is white and the dial will give a strong green lume effect in the dark. 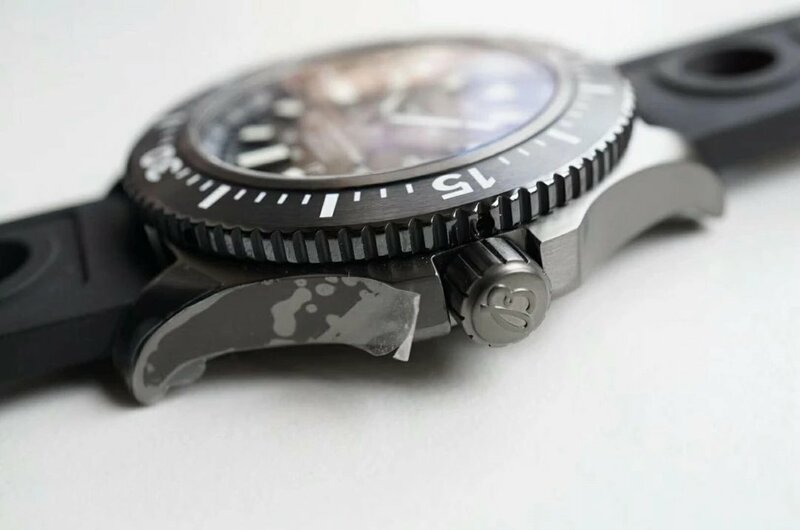 Second hand in the center features an orange arrow-shaped tip, which could still clearly indicate the seconds in dark deep sea. 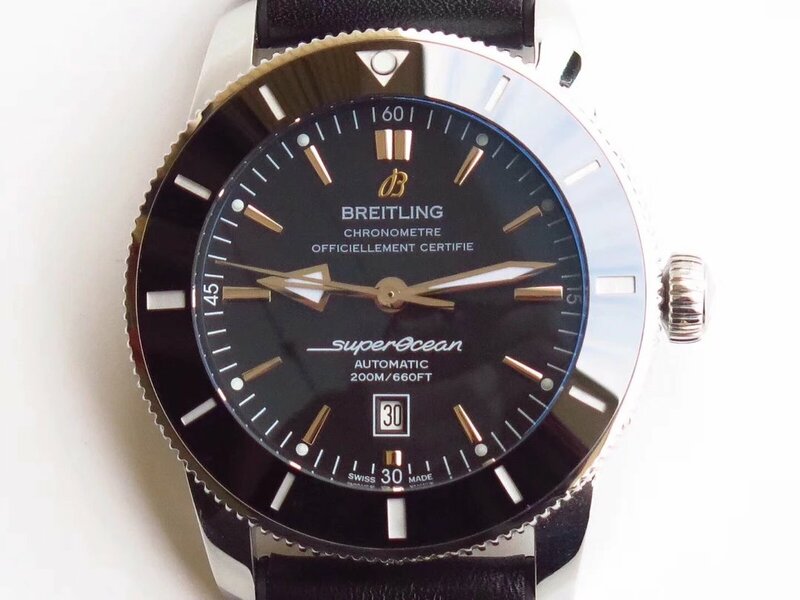 Although the replica is 44mm in diameter, I think its dial is a bit crowded, not looks that generous on Superocean Heritage II I reviewed before. 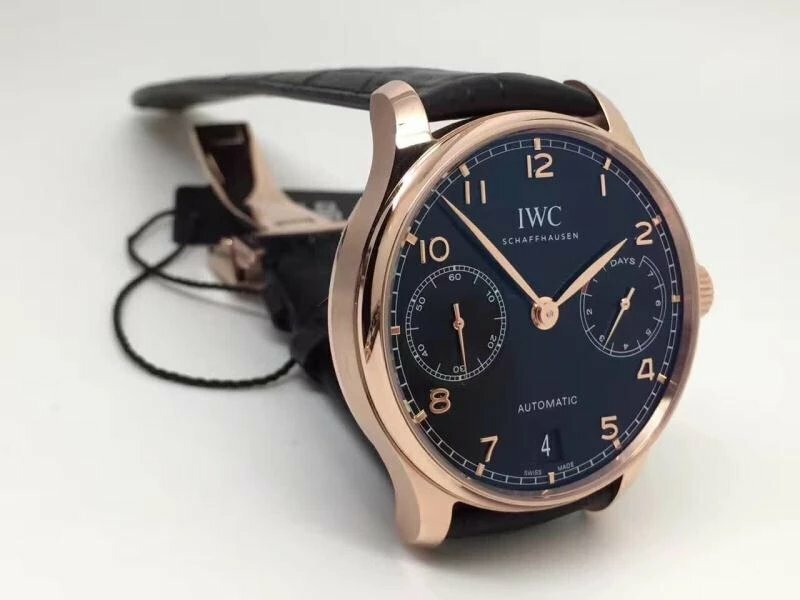 IWC Portuguese 7 Days Power Reserve is a great dress watch, except Submariner, it is the watch which our factories are mostly likely to replicate. 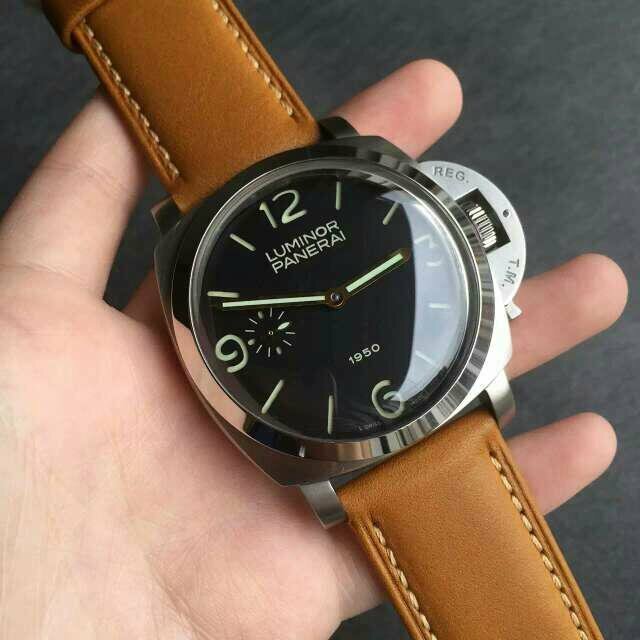 Portuguese 7 Days Power Reserve is loved by a lot of watch fans and there are a lot of versions that have ever appeared in our market. 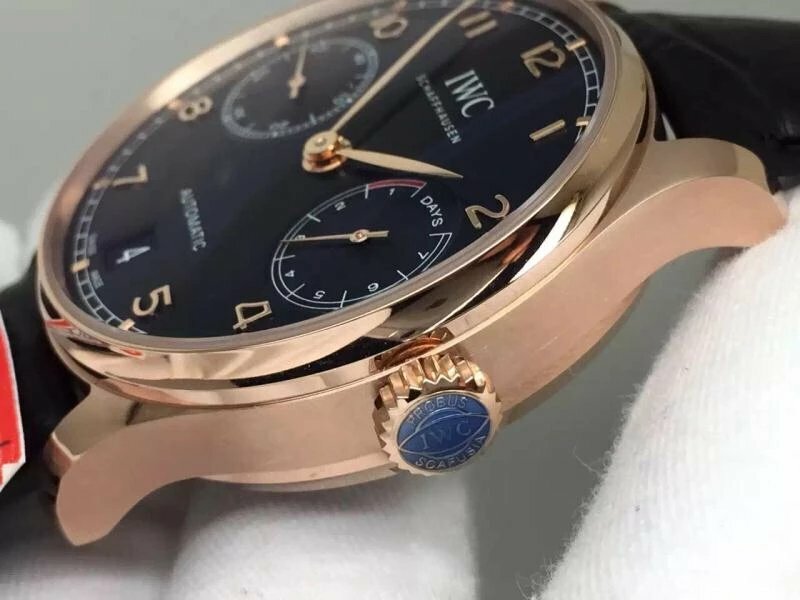 From the earliest version with false power reserve, to the ultimate version with real 7-day power reserve ability, we all witnessed the development of this IWC replica watch. 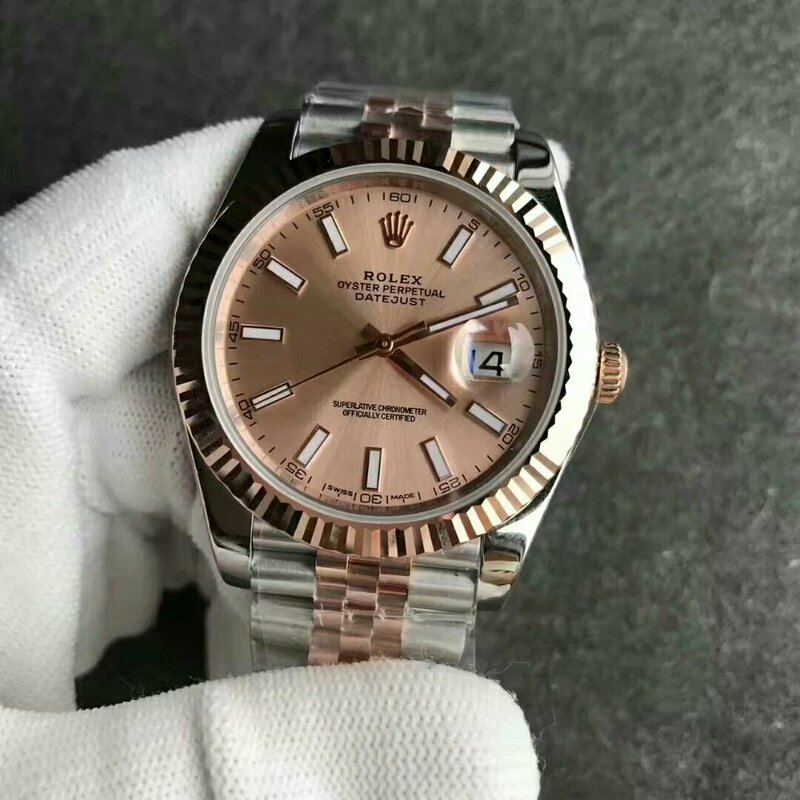 At the beginning, there was only one small factory that replicated this Portuguese 7 Days Power Reserve, although the replica at that time was not perfect, it still created a sales miracle, the replica Portuguese 7 Days Power Reserve was out of stock for a long time. 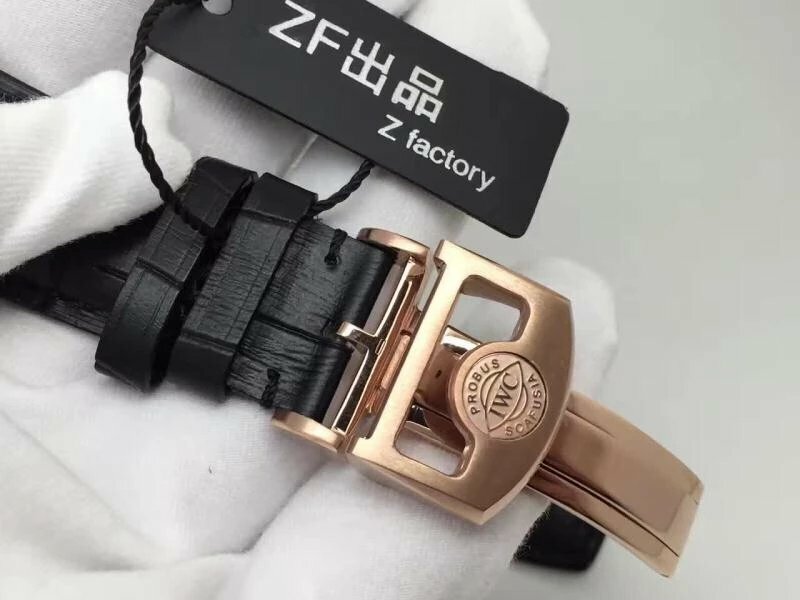 Today, more than five different factories manufactured this watch, among them, the best one is from Z factory, which we call it ZF version. 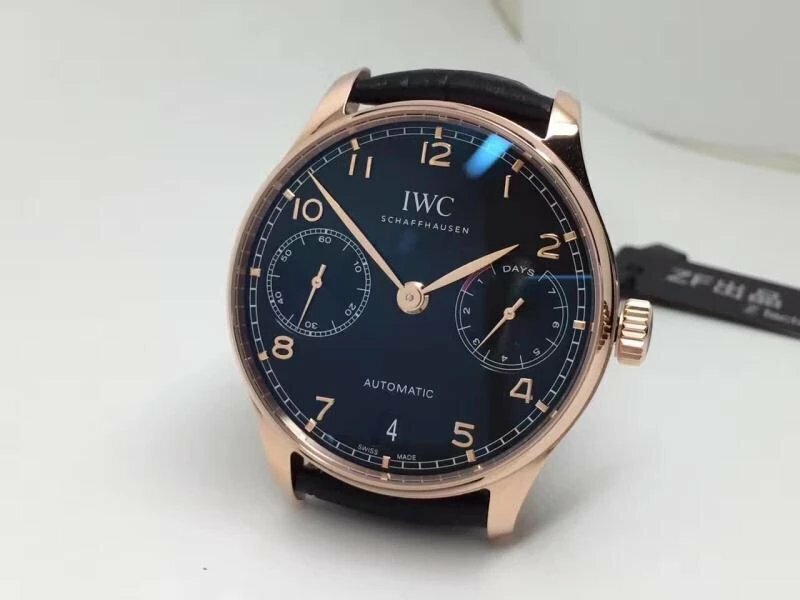 Actually the Portuguese 7 Days Power Reserve replica made by other factories are also fine, but the one made by Z factory is closest to genuine, we can still see Z factory continued to improve this replica and released the latest version, now the latest version of IWC Portuguese 7 Days Power Reserve replica is ZF V5, which is the one I am going to give a review. Let’s begin. 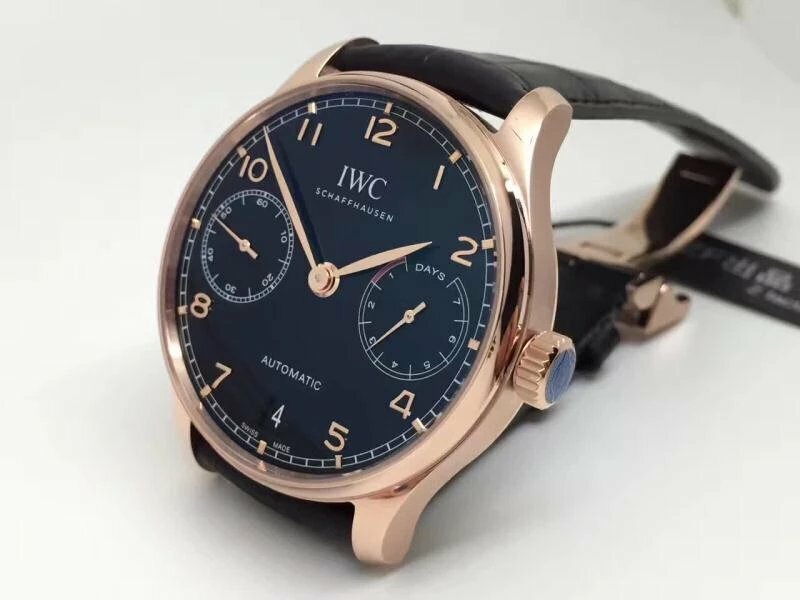 The reference number of this IWC Portuguese is IW500704, whose case is made of 316L stainless steel and plated with 18K rose gold, case is measured to be 42mm in diameter and 14mm thick. 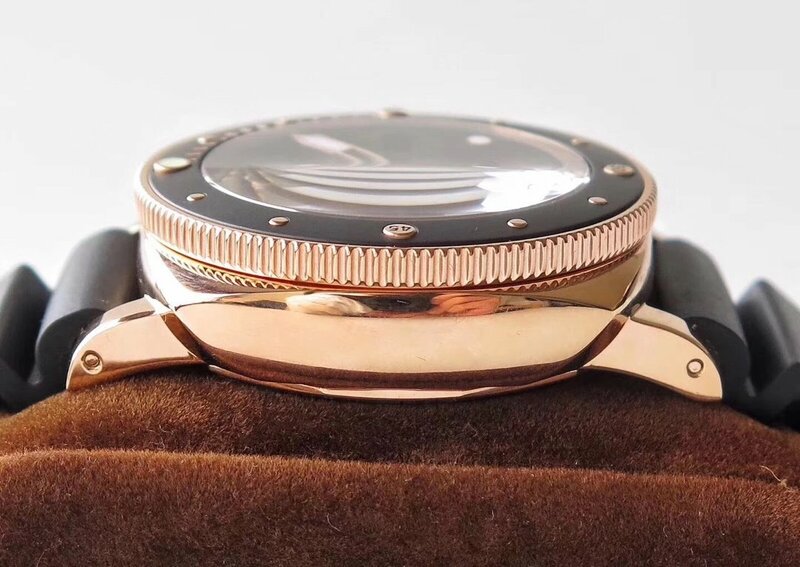 Bezel, case, case back construction, polishing and satin finish processing are the same as genuine. 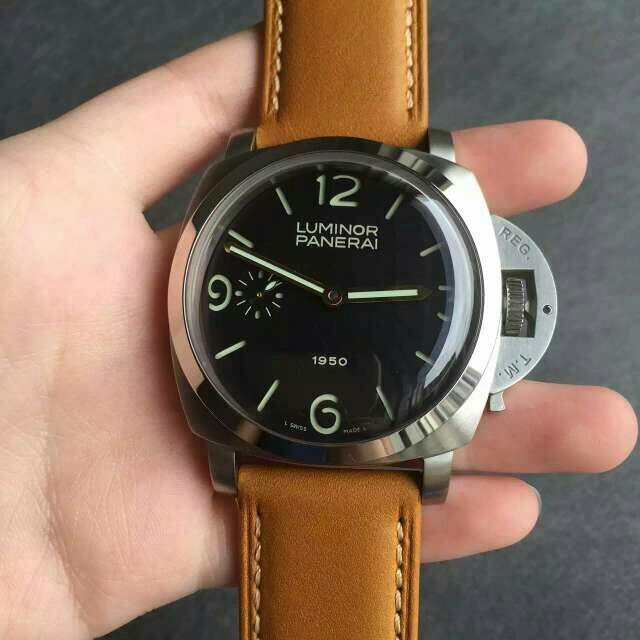 The round bezel and case are forged into one piece. 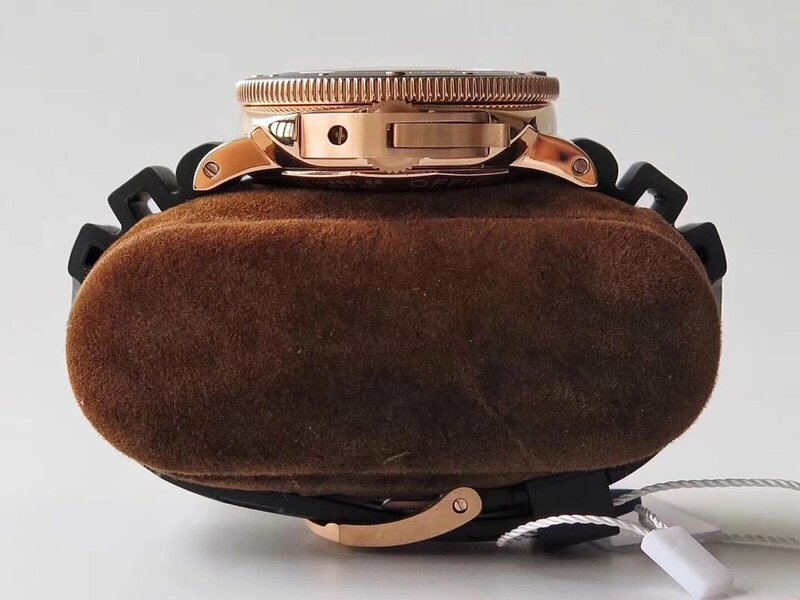 See from the side, the case is not only has the same thickness as genuine, but also the factory made a lot of efforet in brushing the case side, which looks perfect. 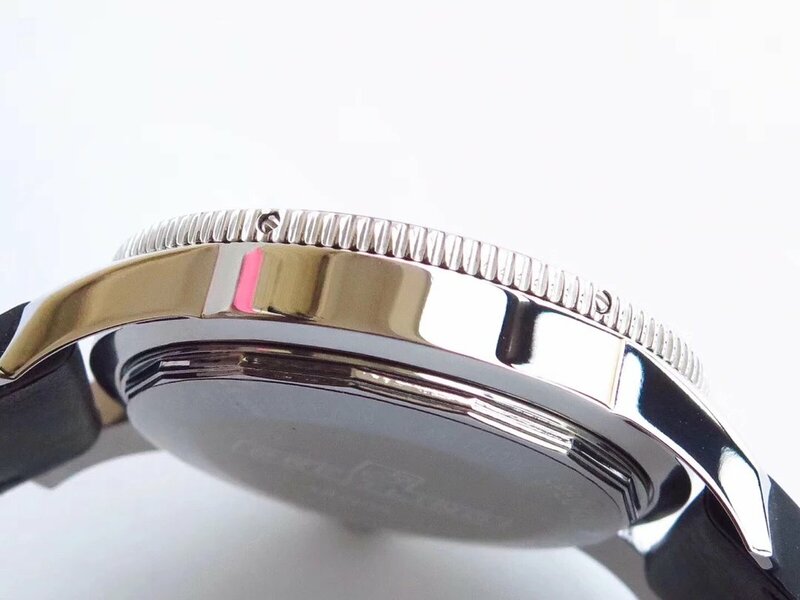 Case edges and corners have been finely polished according to the original, so they feel round and smooth, no metal burr feeling when wearing on hand. 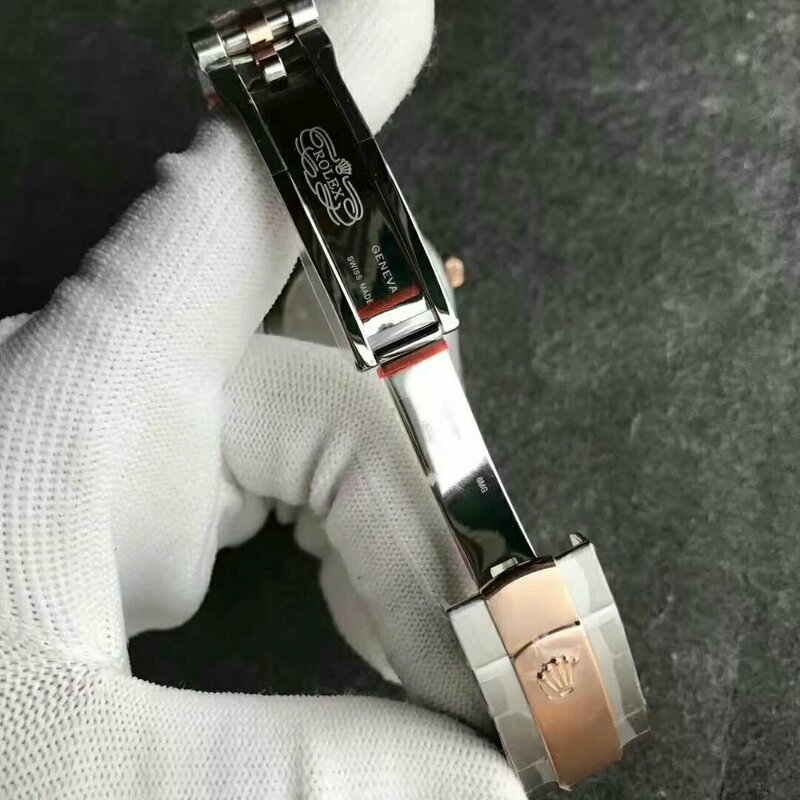 Crown has the same size and structure, the letter engravings are correct in thickness. 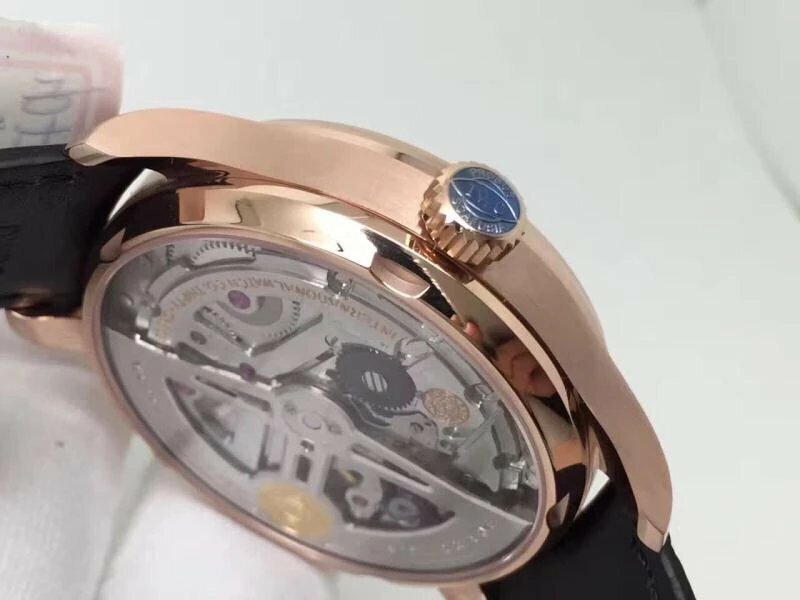 Case back also has right configuration, first, each replica has an unique reference engraved, second, the transparent crystal uses sapphire and is screwed down. 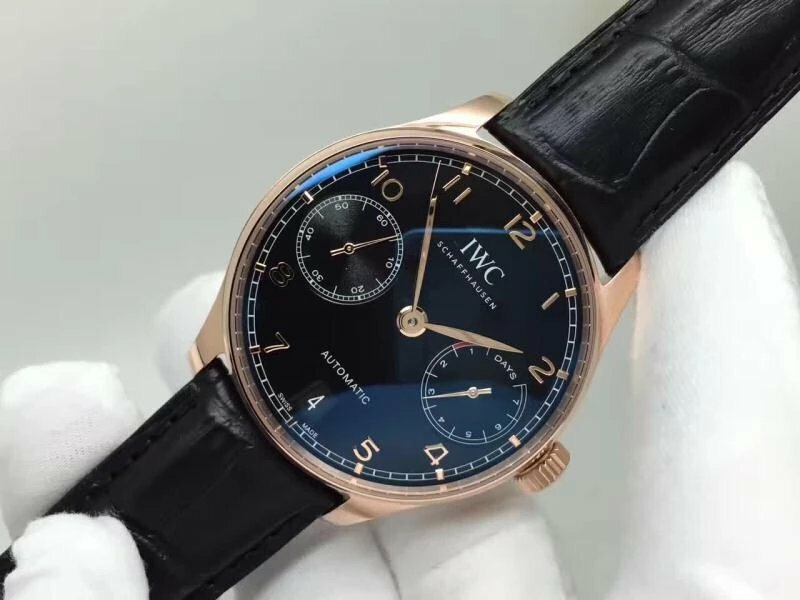 The dial of the replica IWC is black, Arabic hour markers and hands are all plated with 18K rose gold like case. 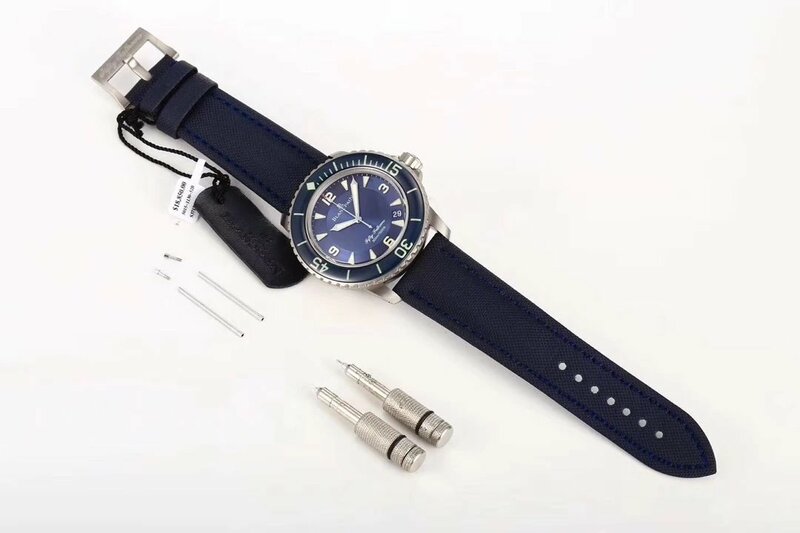 Small second hand is working on subdial at 9 o’clock, the small hand on 3:00 subdial is indicating remaining power reserve. 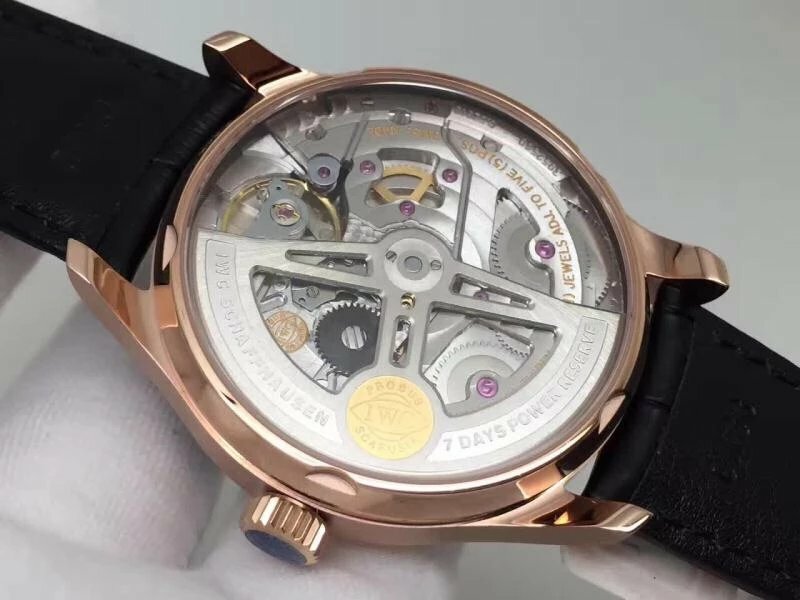 About movement, ZF made a delicate polishing on paltes, there are fish scale patterns and Geneva Stripes, ruby and golden engravings. It is a clone Cal. 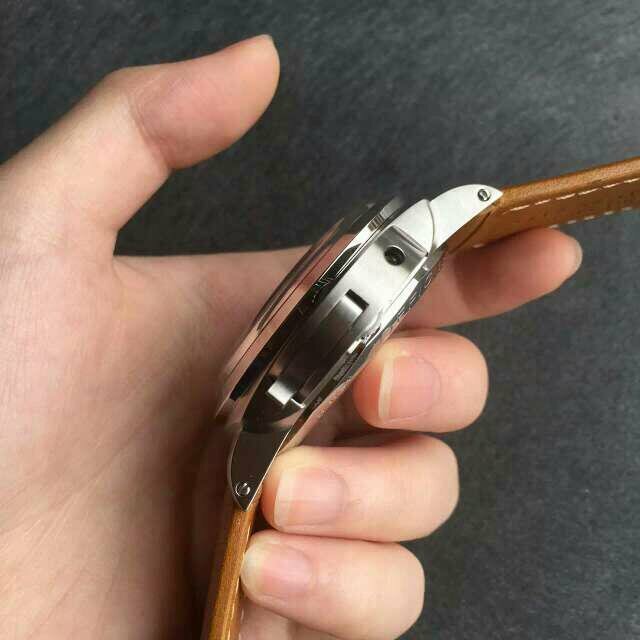 52010 movement based on a Chinese Automatic movement. The power reserve could be up to four and half a day, this is already amazing. 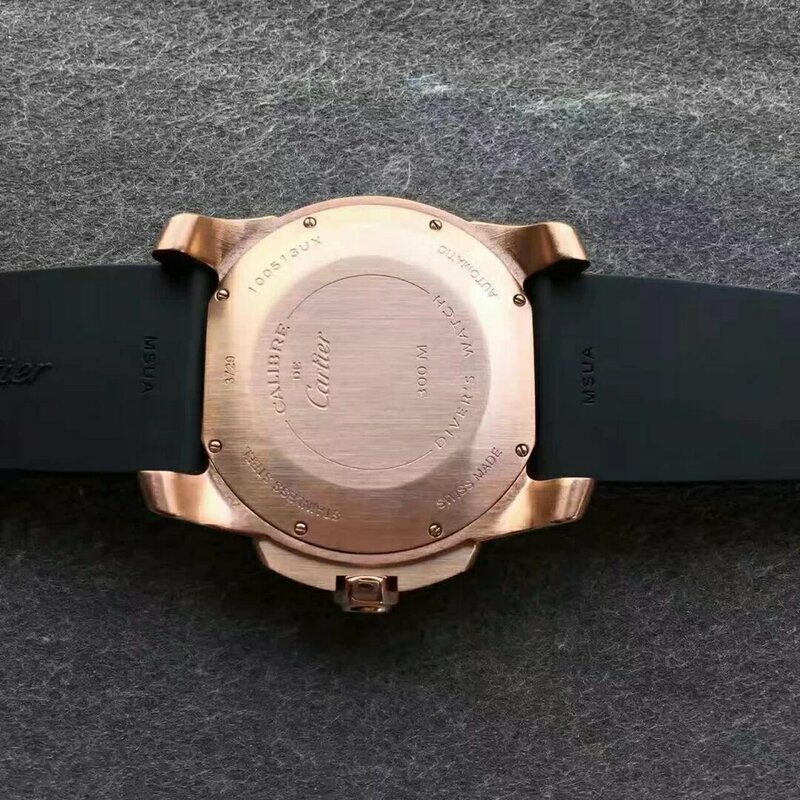 You know, among all high quality replica watches, the most outstanding clone P.3000 only has 5-day power reserve ability. At the same time, in stability, clone Cal. 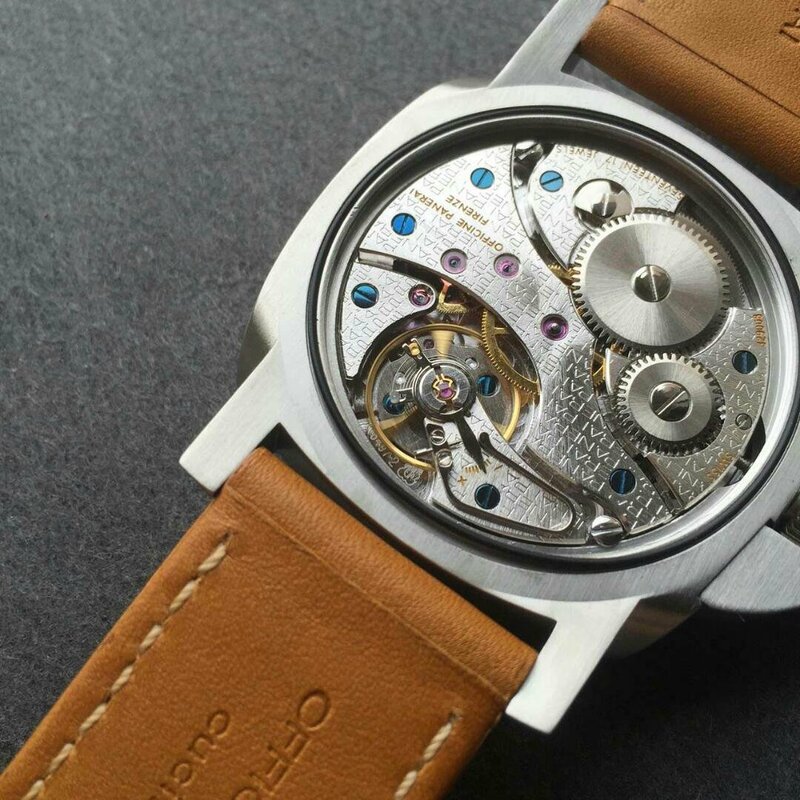 52010 also fully meets the standard of an outstanding movement. 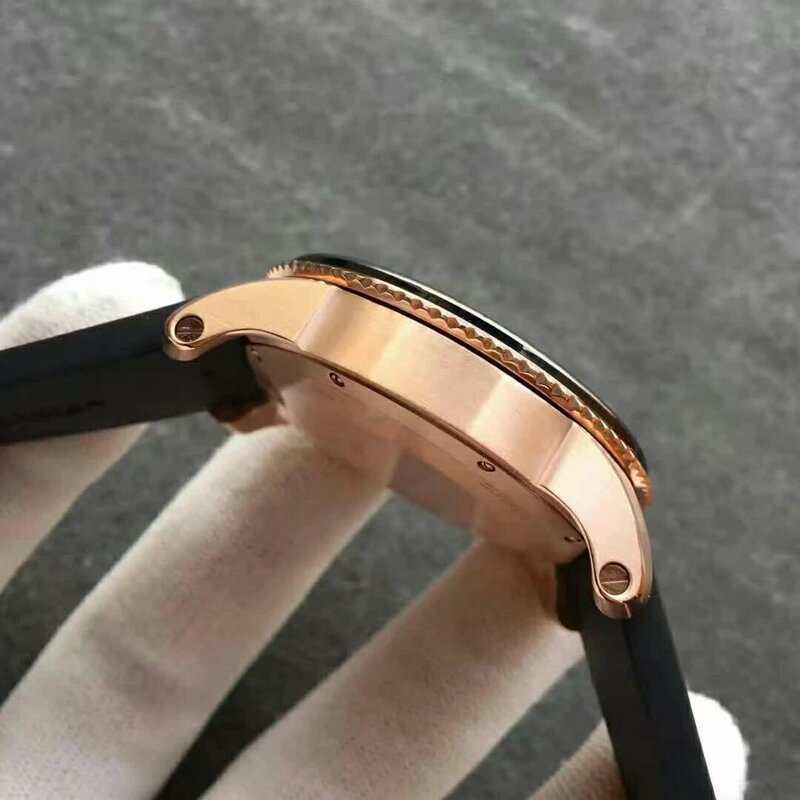 Although it is a see-through case back design, you do not need to worry it could be spotted as a fake movement. The following are more detailed specification of the replica. 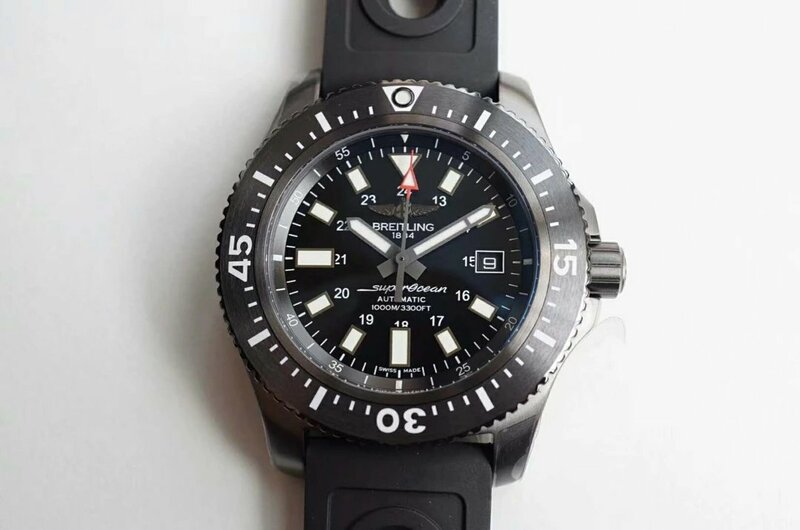 Superocean is a good diving watch series of Breitling. 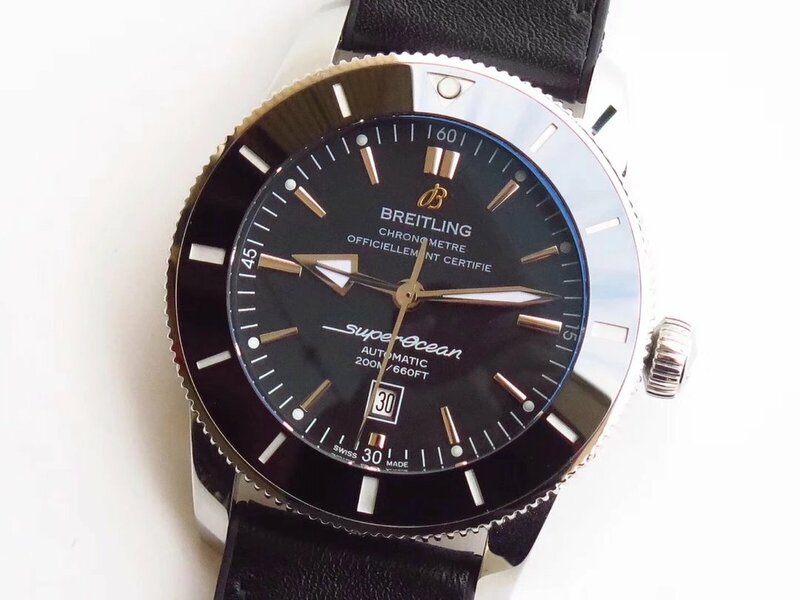 There are a lot of diver’s watches but I never seen one that looks so fresh like Breitling Superocean. 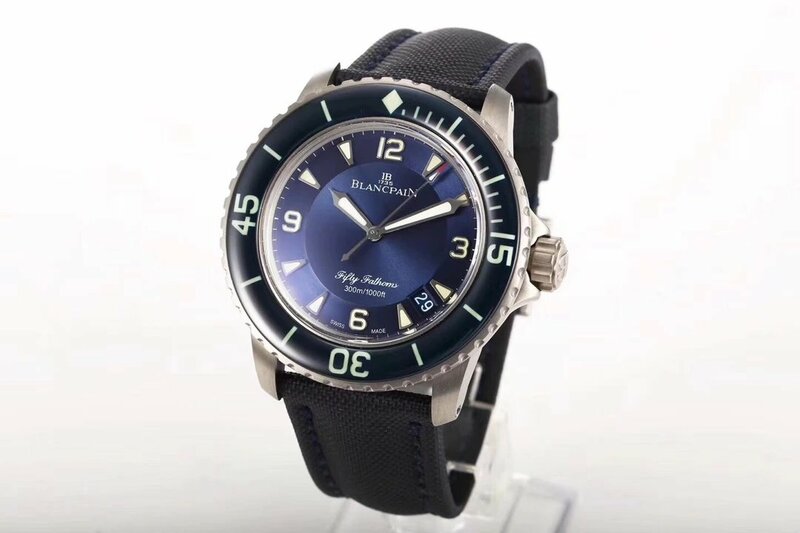 With different color options on bezel and band, I think Breitling Superocean is the best diver’s watch for men to wear on the colorful summer. 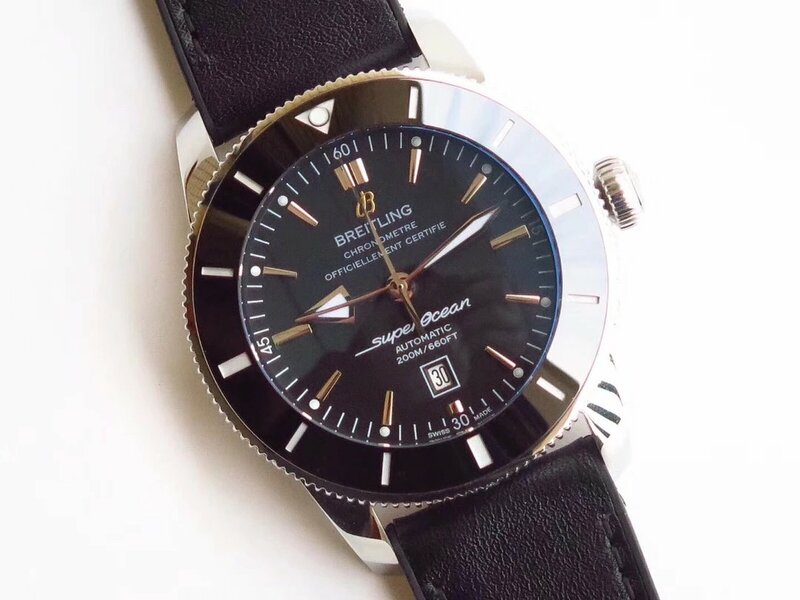 Now the watch here we will discuss is a replica of Breitling Superocean Heritage II, genuine watch is a 60 YEARS OF ADVENTURE AND DISCOVERY edition by Breitling, and the replica here is developed by a famous factory that manufactures high end 1:1 copy watches. 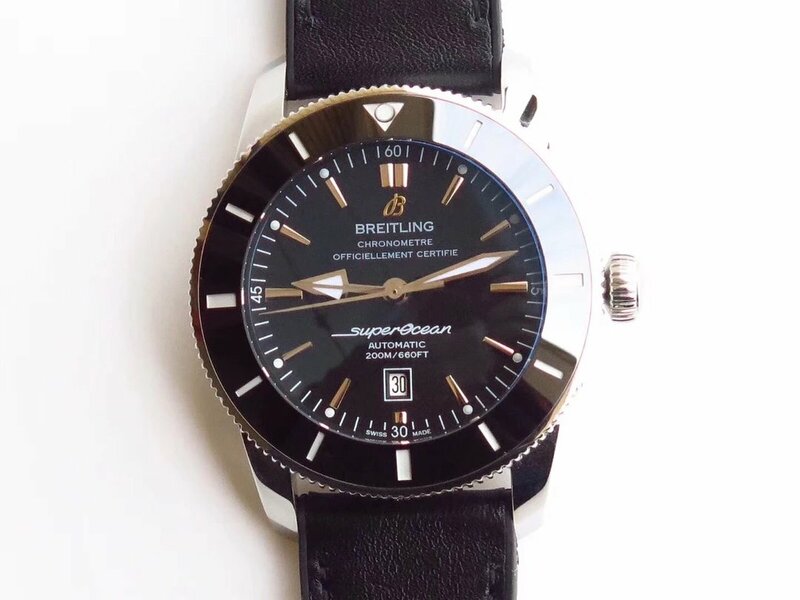 The replica Breitling Superocean II looks perfect in its style, fresh and clean design makes it more suitable for men who love simple and light diving watches, but not for those are pursuing tough watches. 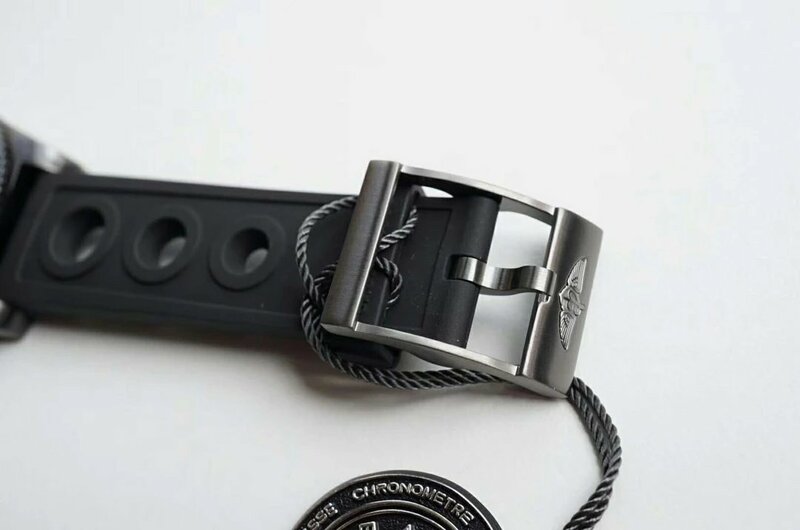 The case is made of 316L stainless steel, measured to be 46mm in diameter and 15mm in thickness, the bezel uses non-skid tooth design and features a black ceramic insert, which is proof to shock and scratch. 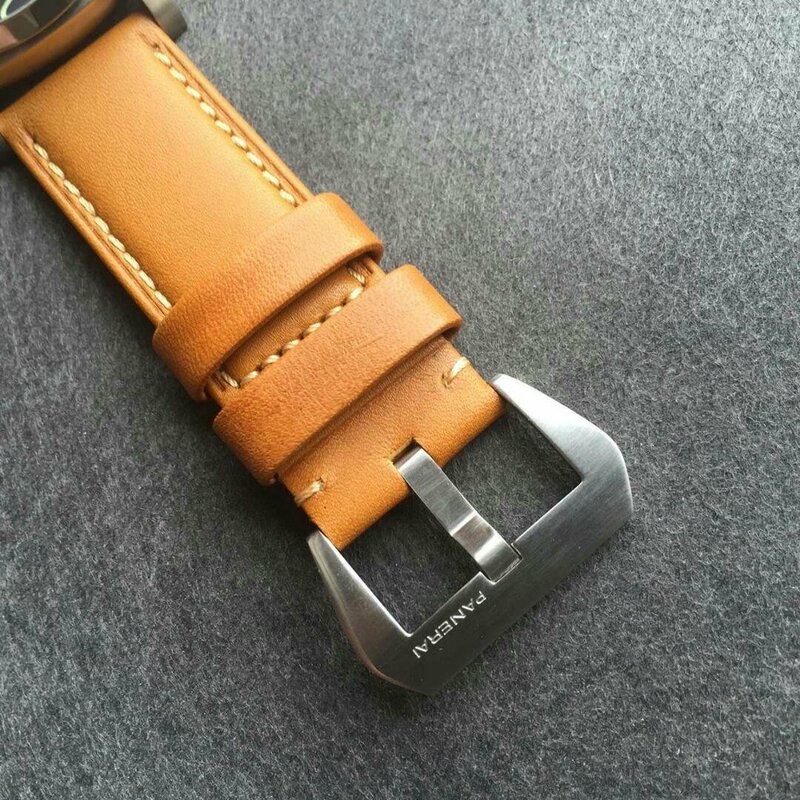 Screw-in crown guarantees a good water resistance, which has been tested to be 50m by the factory. 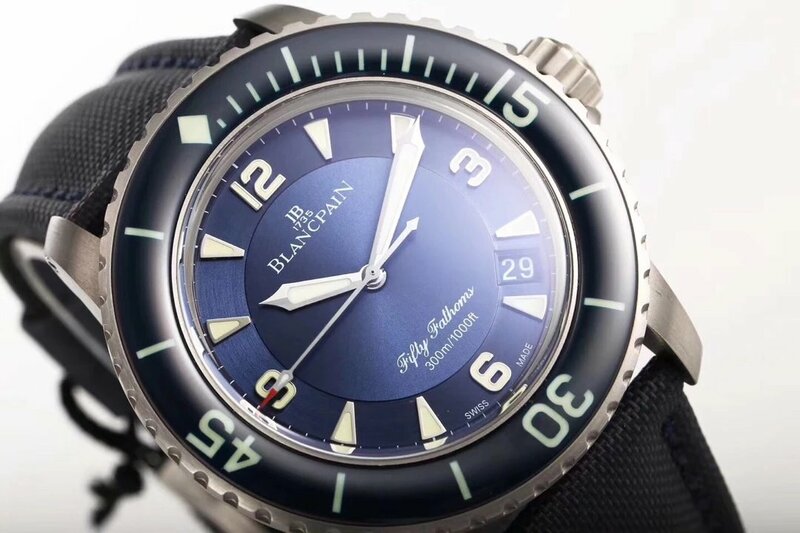 Dial is in black and has, silver bar-shaped hour markers have white lume dots beside, both minute scales and dial printings are in white color. 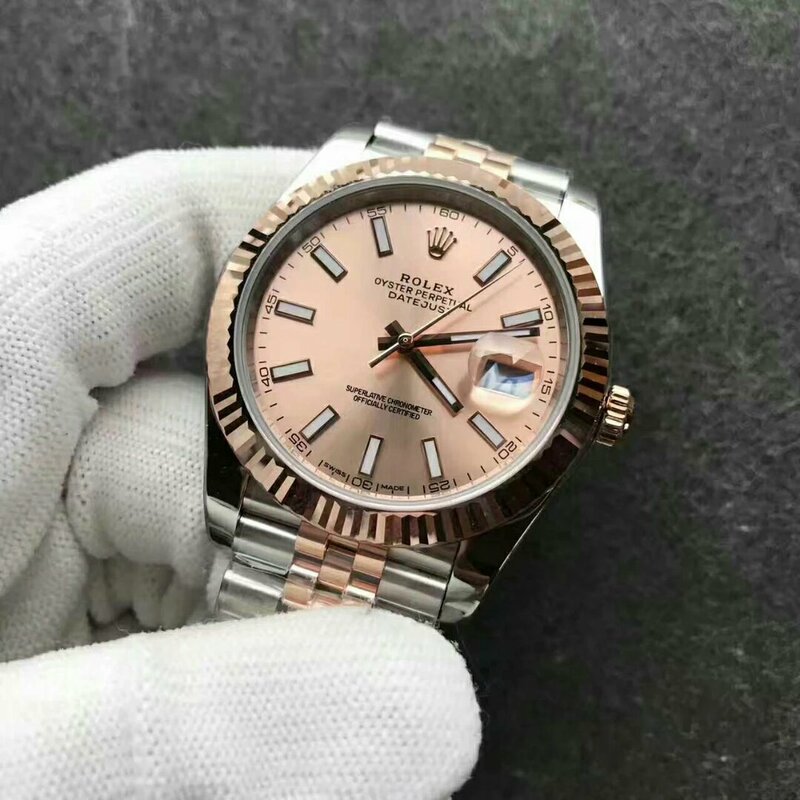 Date window is set at 6 o’clock featuring a white frame. 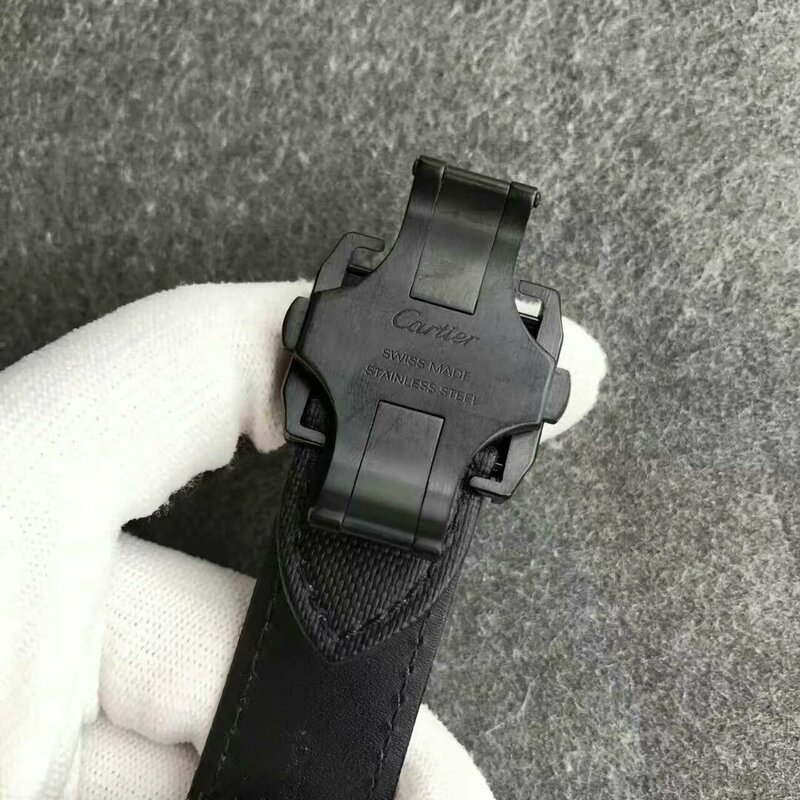 Like dot hour markers, the arrow hour hand and sword minute hand are also applied lume material, which will emit super green light in dark place. 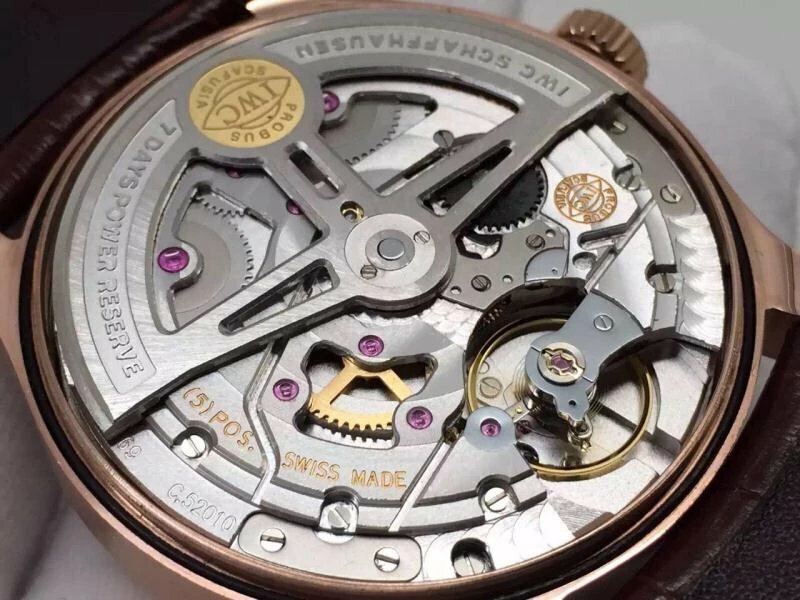 The replica is powered by a Swiss ETA 2824 automatic movement. Before out of factory, the timing accuracy and date have been tested for 48 hours. 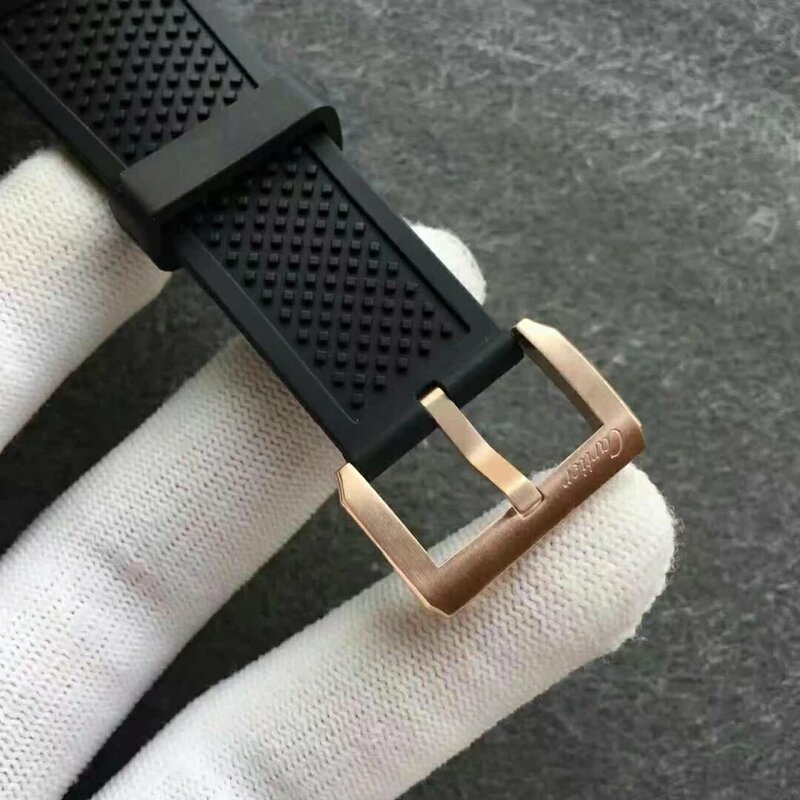 Black gummy band looks good on this replica, it perfectly matches black ceramic bezel and dial. 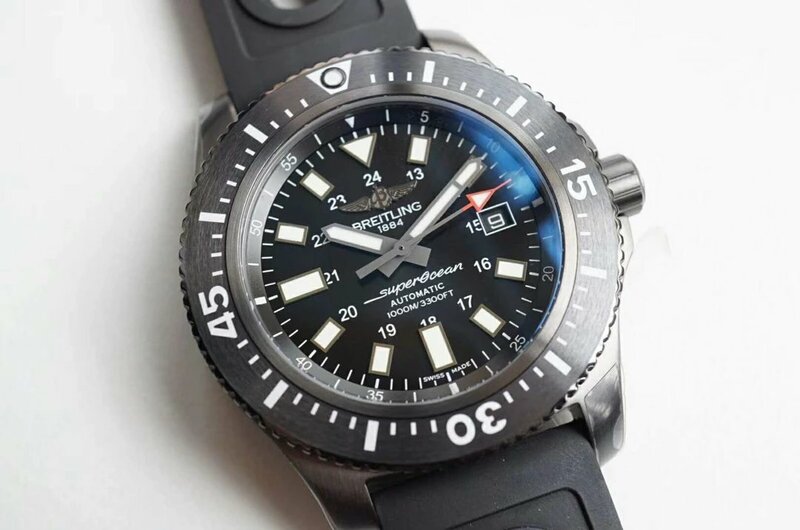 If you are searching for a diver’s watch that does not look that heavy like Submariner or Submersible, then Breitling Superocean Heritage II will be a great choice. 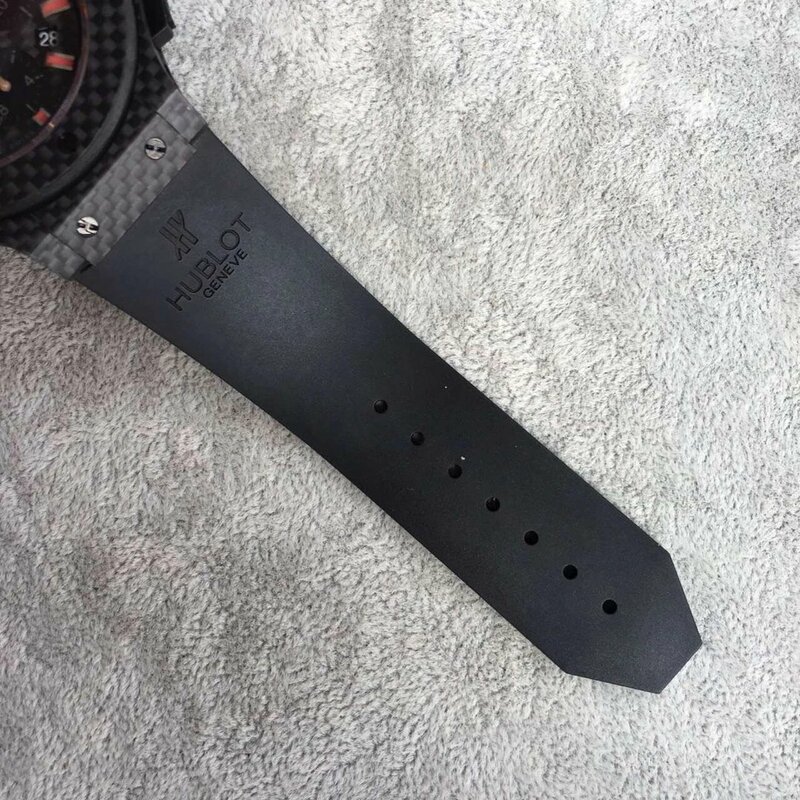 Hublot is one of the fastest developed Swiss watch brands in recent years. 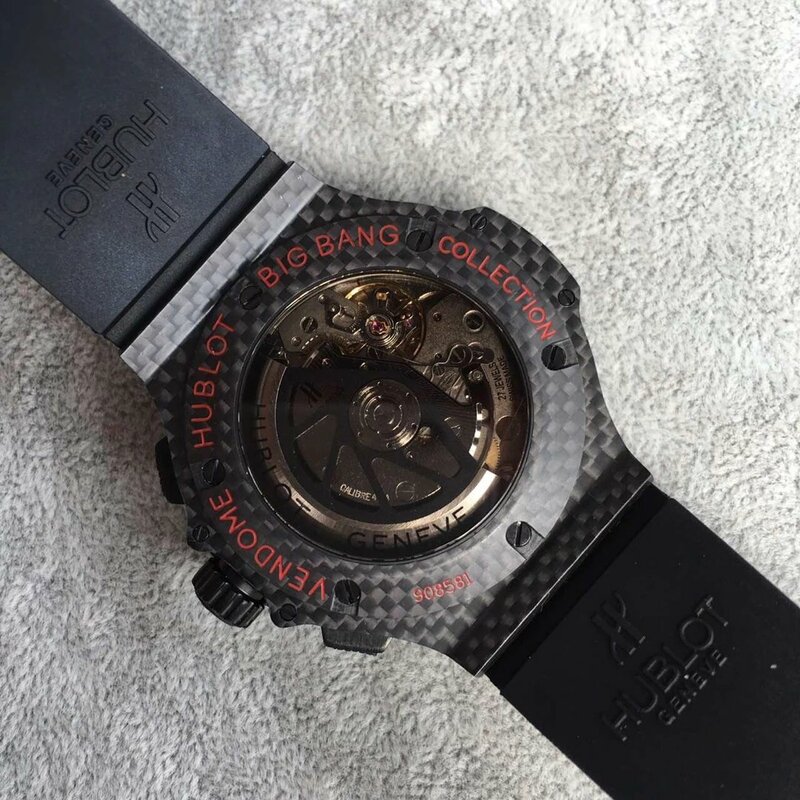 With its unique shape design and marketing strategy, Hublot Big Bang has won a high reputation among majority of sports watch fans. 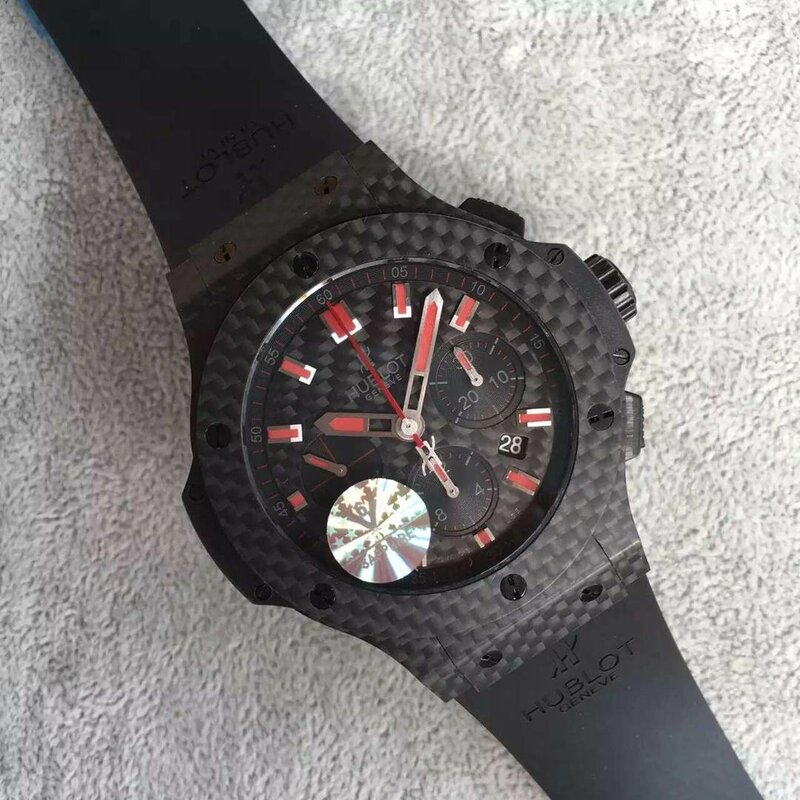 Hublot Big Bang is also the classic fusion representative in watch making industry. 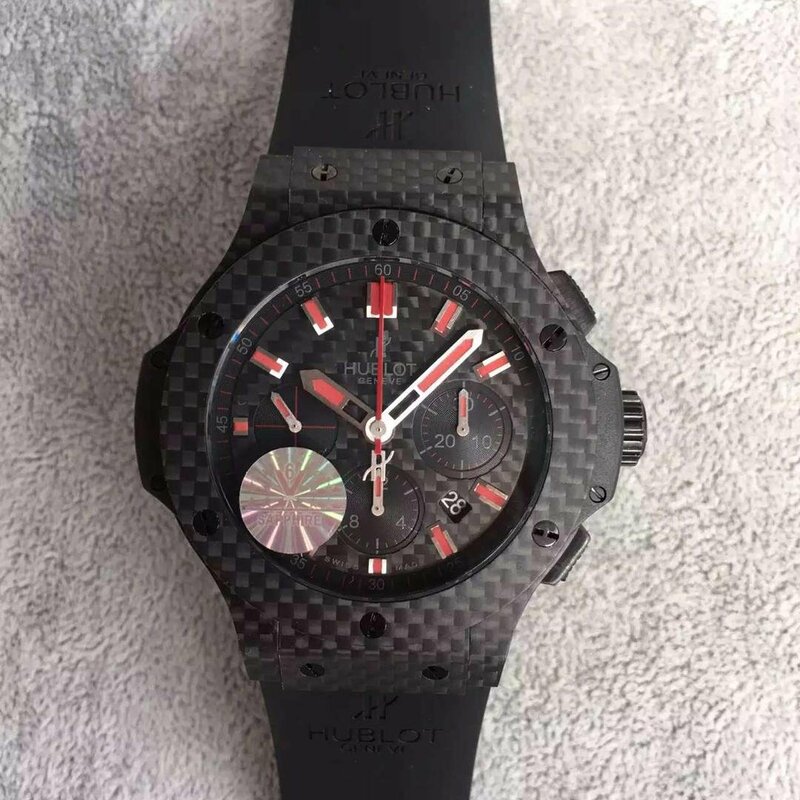 Now I am going to review a replica Hublot Big Bang watch made of carbon, with red element in its black outlook, the watch looks like a red devil that is watching you in the dark. 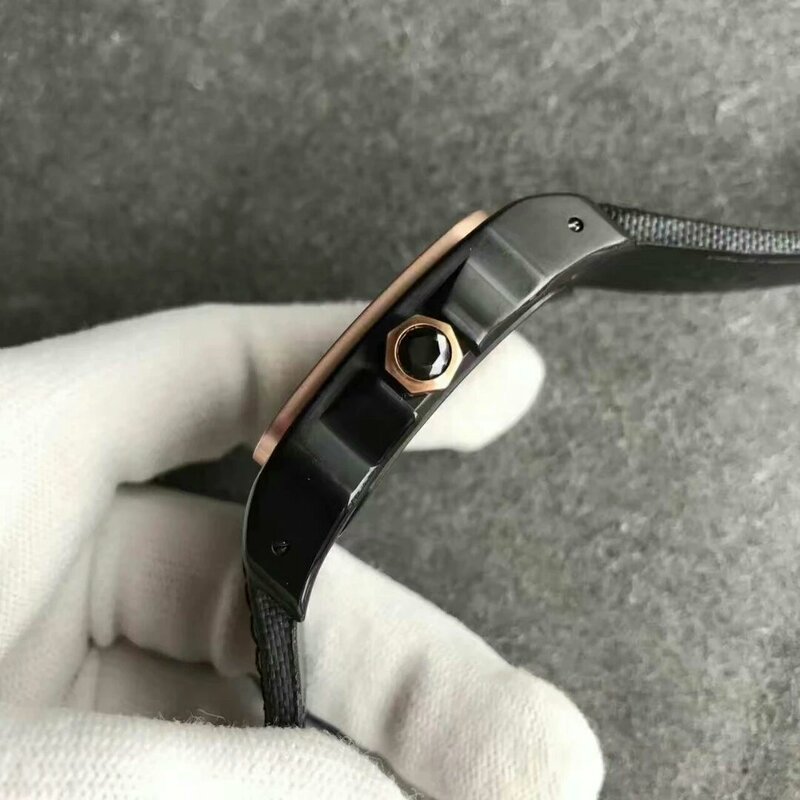 The replica feels light in weight because it uses advanced carbon fiber in case and bezel material. 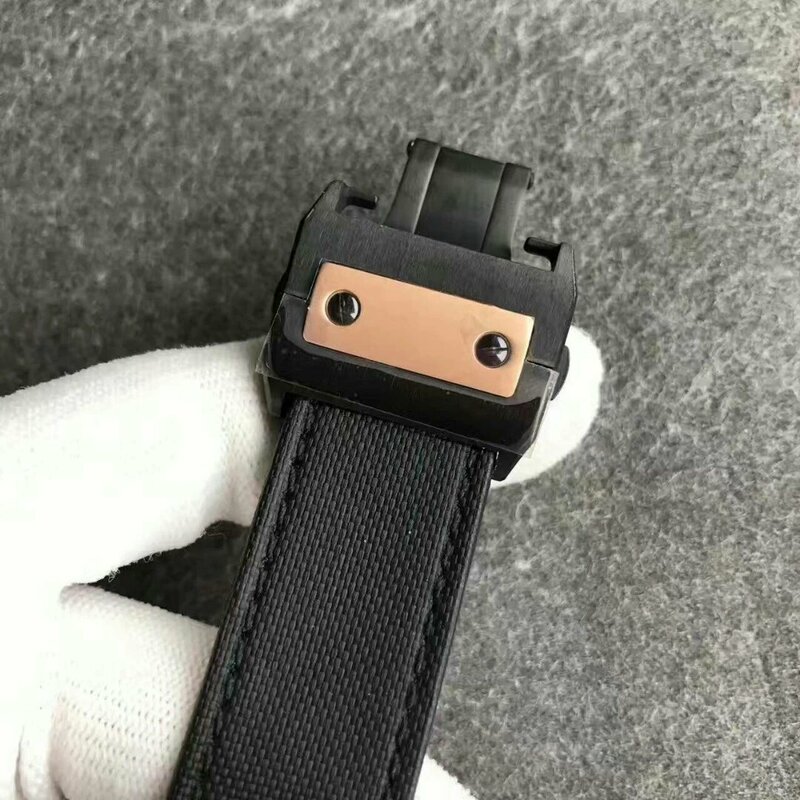 Case size is 44mm(diameter)*15mm(thickness), unique carbon fiber patterns on the case catch people’s eyes immediately, there are ten black screws fixed on the case, in classic H shape. 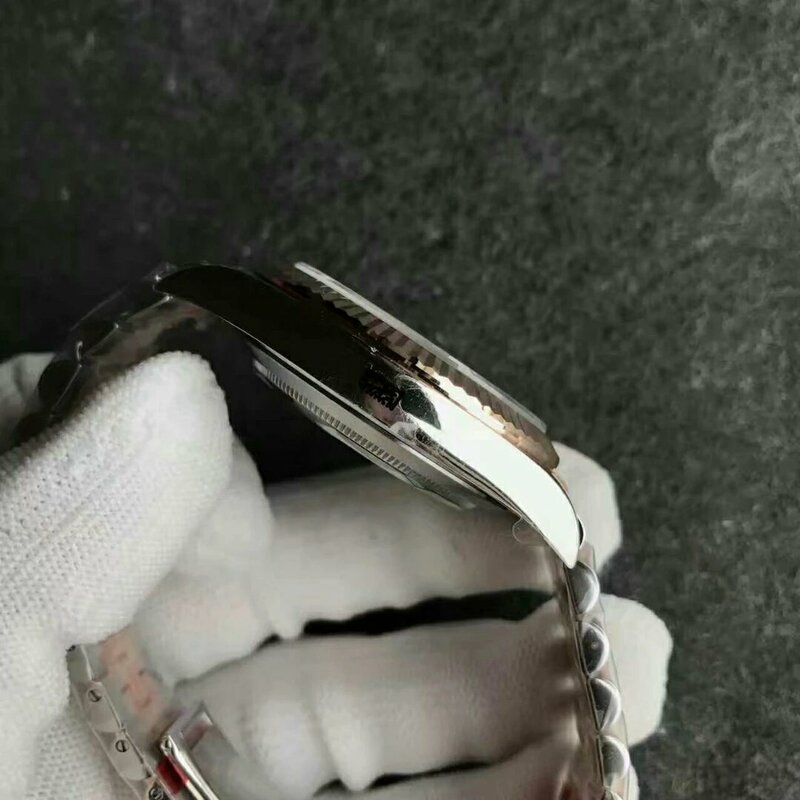 On case back rim, there are red engravings of “VENDOME HUBLOT BIG BANG COLLECTION”. 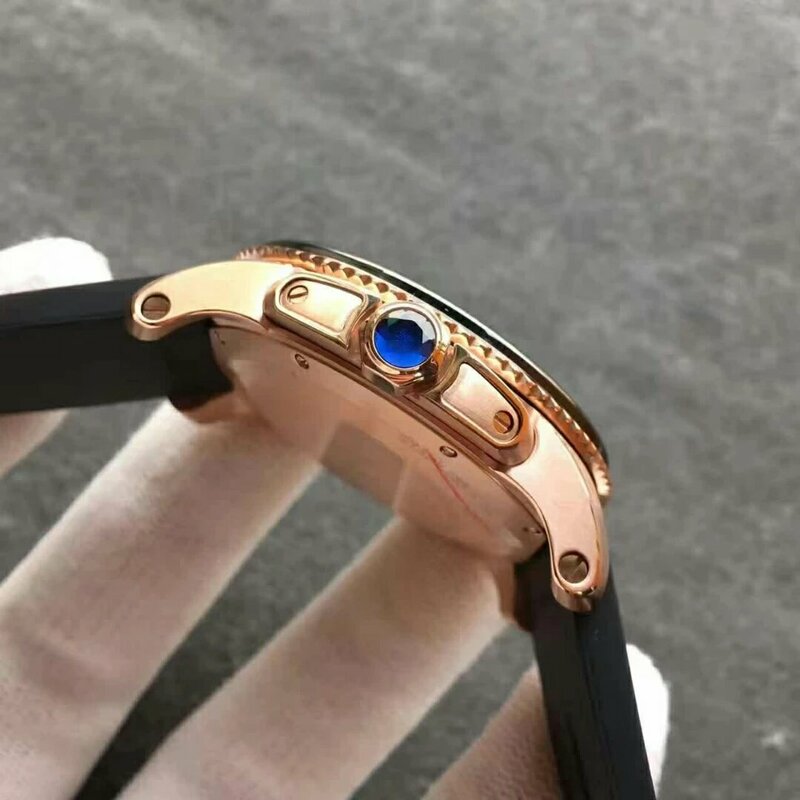 Case back is see-through sapphire crystal. 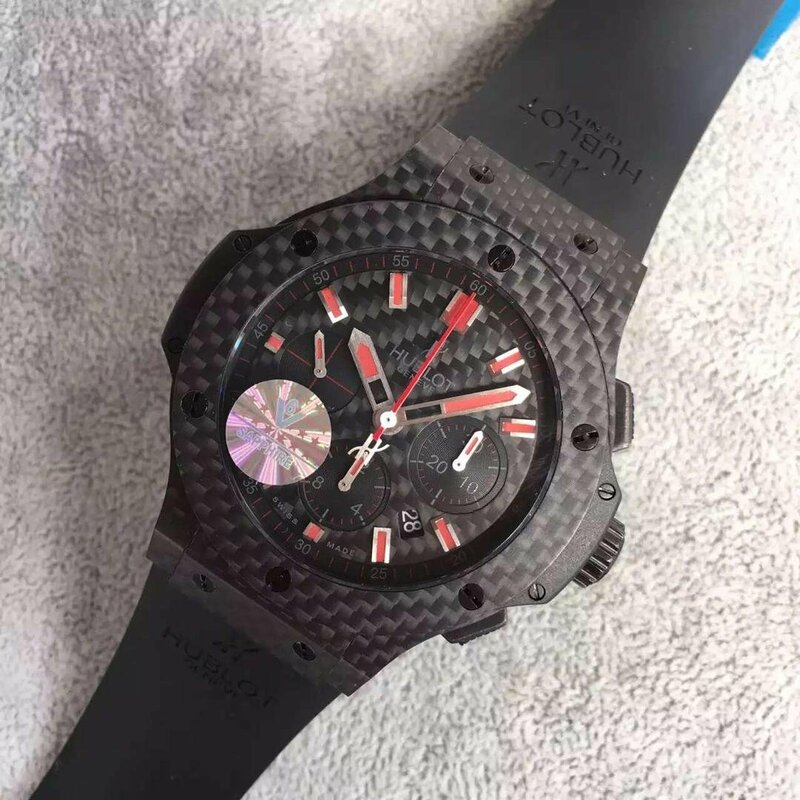 Black dial is also carbon fiber made. 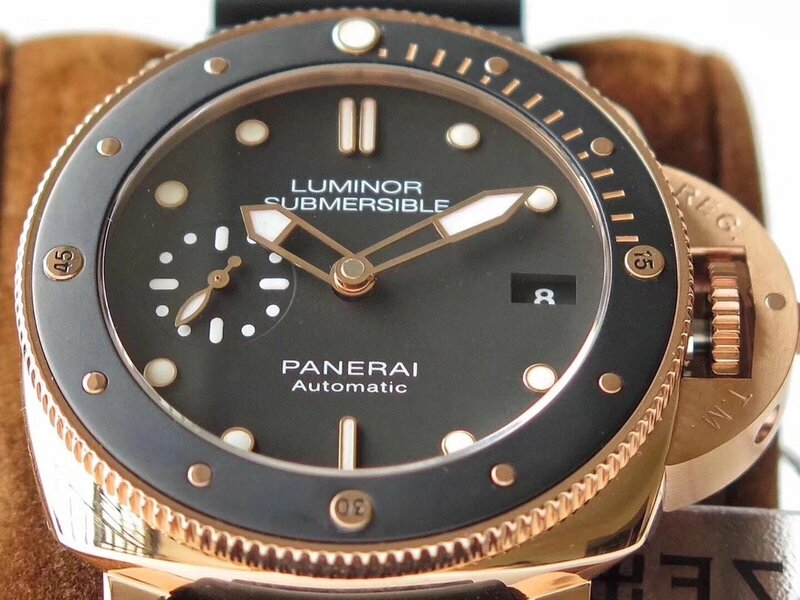 Both hour markers and hands are applied red lume material. 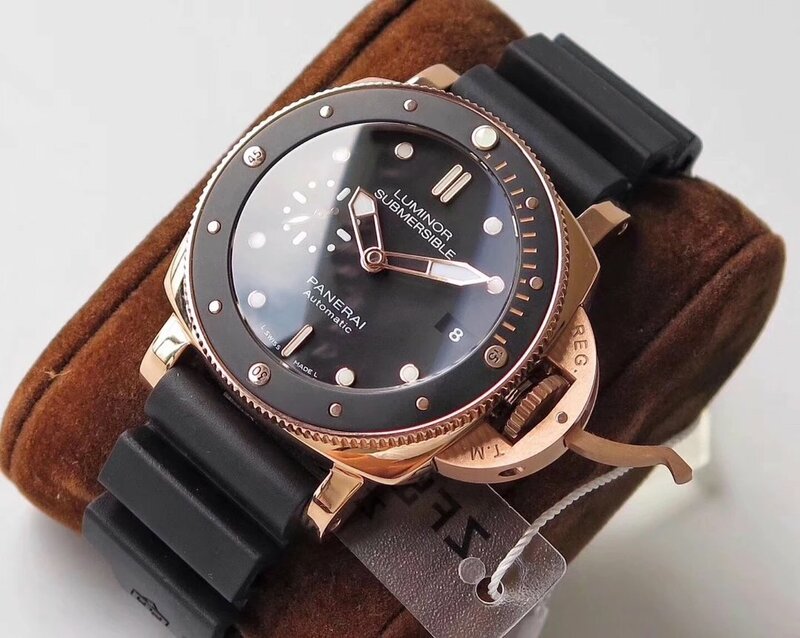 Small second hand is running on the subdial at 9:00. Central second-chronograph hand is in striking red color and it will start chronograph work once you press the button at 2:00. The replica Hublot is powered by a real Valjoux 7750 movement, so the chronograph functions well, which means 30-minute and 12-hour chronograph counter works normally, just the same as genuine watch. A date window is set at 4:30, it is very small but still clearly readable because of its white date font. 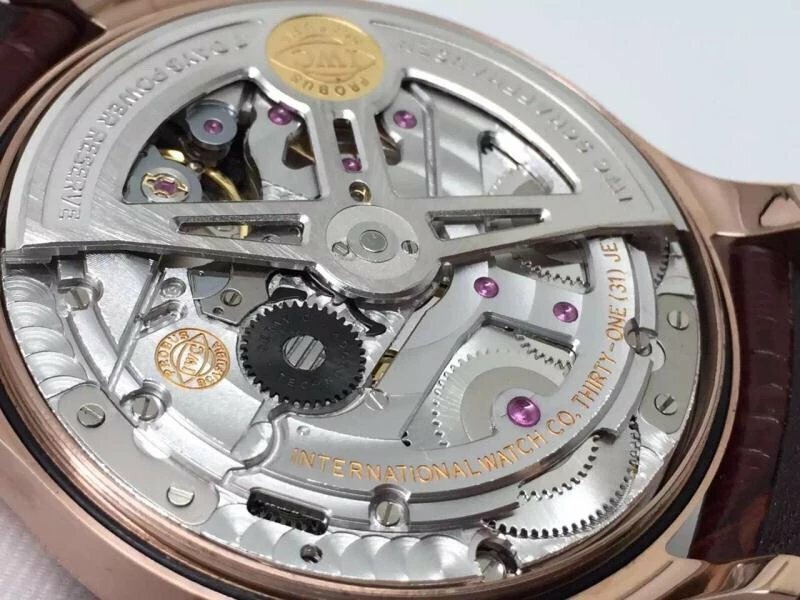 V8 uses a 7750 to clone this HUB4100 movement, which beats 28800 times per hour and has 36-hour power reserve. 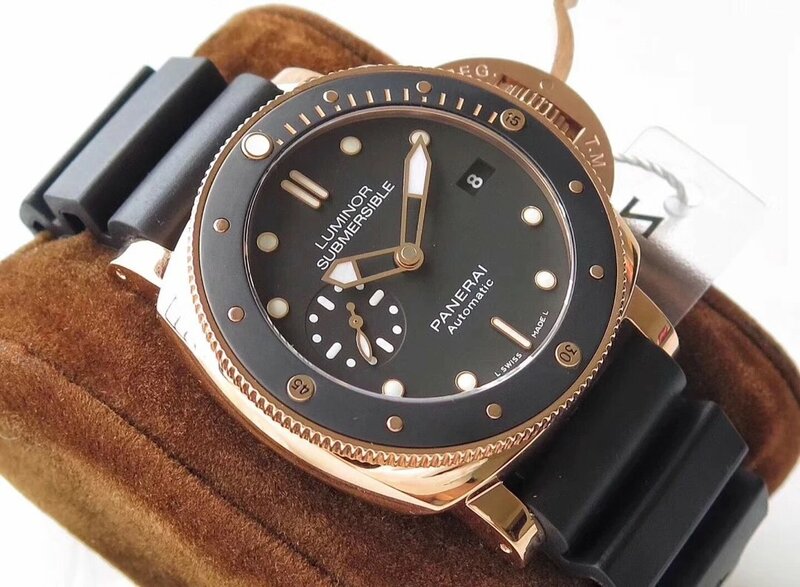 If you have read my reviews about Panerai watches made by V6, then you will have no doubt on the quality of this Hublot, it is superior like other replicas reviewed on my blog. 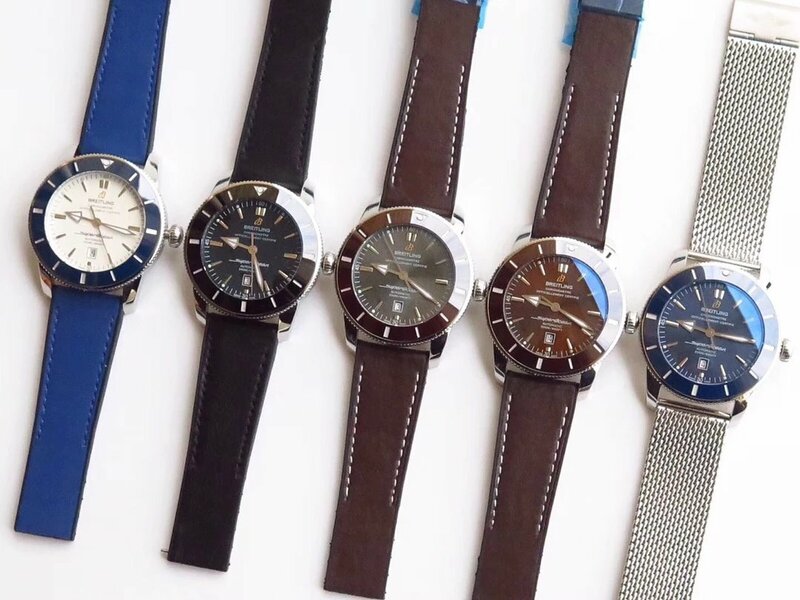 Every Swiss brand has their diving watch series. 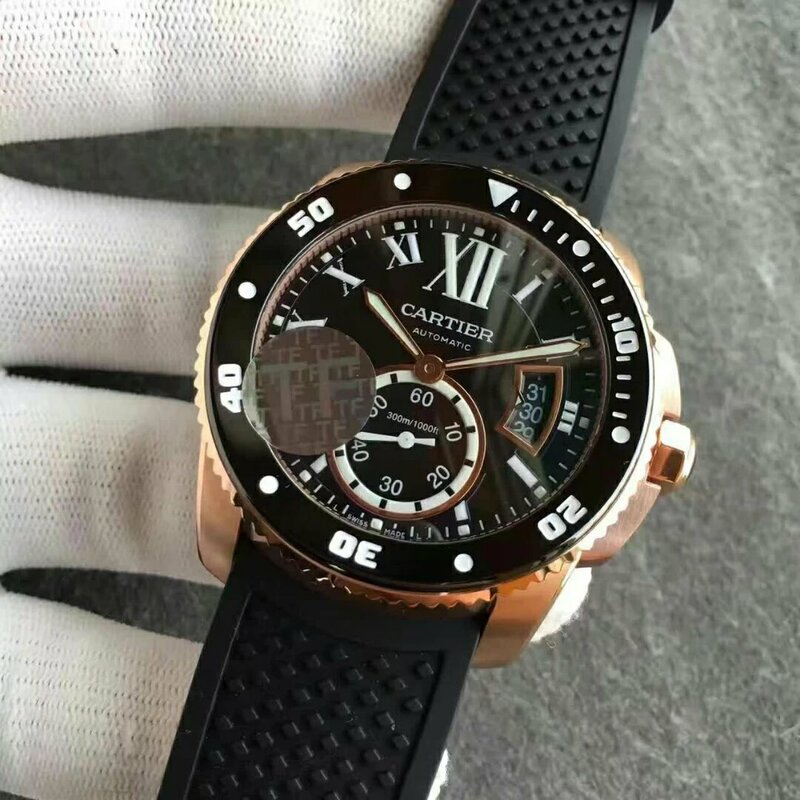 Cartier, as the most famous jewelry maker in the world, also developed a diver’s watch in their collection, it is Calibre de Cartier Diver, which is developed from Calibre series, the watch not only inherits case features of Calibre, but also has its own characteristics, like rotating diver bezel, super dial lume, waterproof rubber band, etc. 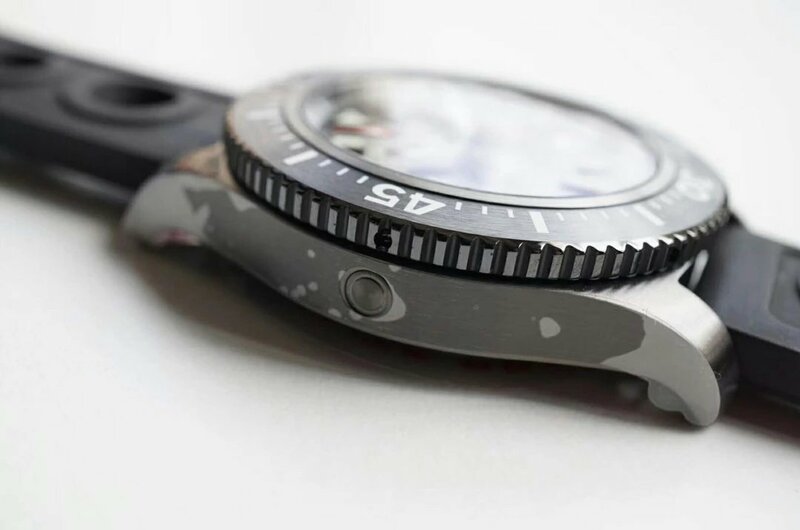 These are all necessary features for a diving watch. 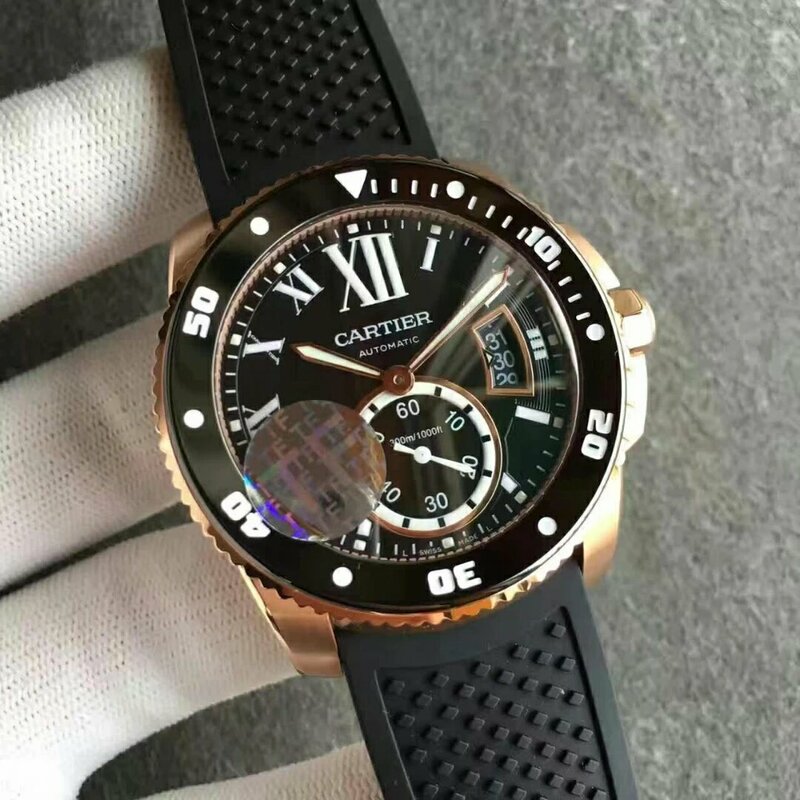 Here I want to give a review of a rose gold Cartier Calibre Diver replica watch, which is made by T factory, we call it TF in following article. 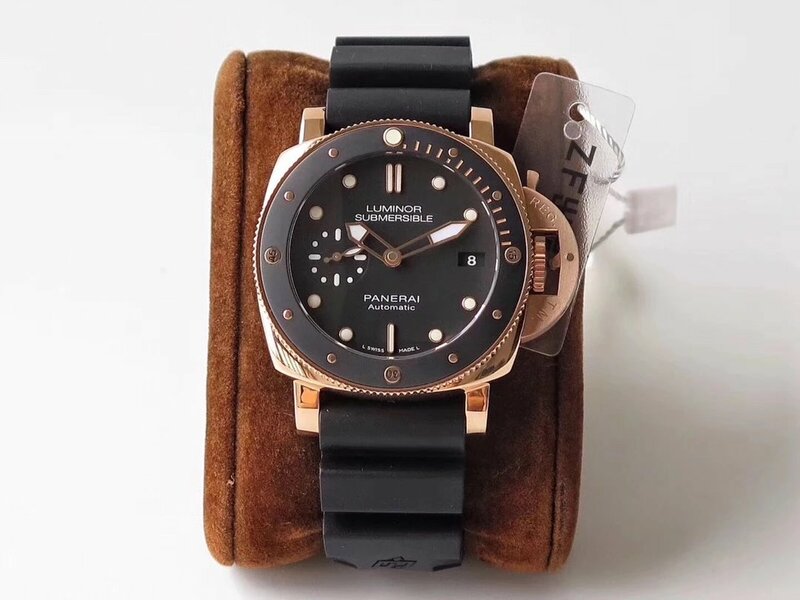 The watch here discussed is a high quality 1:1 Swiss replica, which means it is not a cheap watch and the factory replicated this watch according to every detail of a genuine, TF even claimed that they bought a genuine watch and disassembled it when replicating. 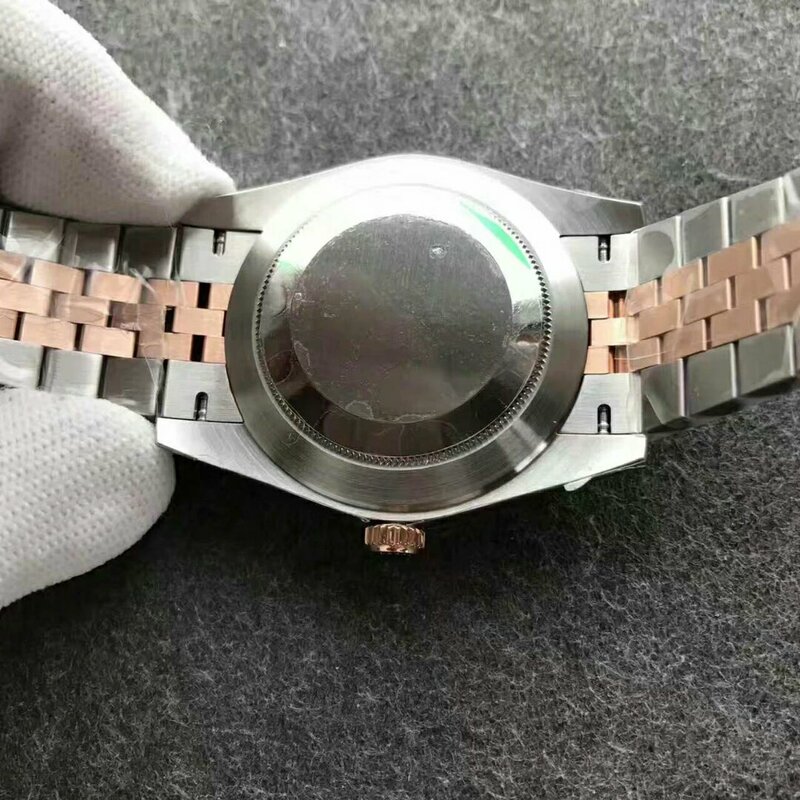 Let us see how the watch is made. 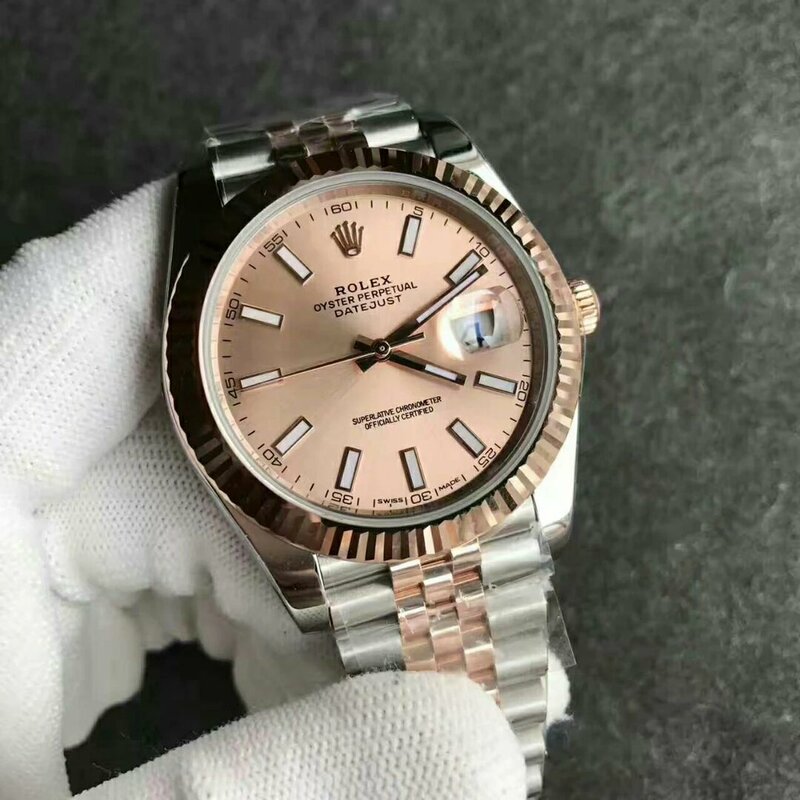 Although it is a replica, its price is a little expensive than most replica watches and sometimes beyond your affordability, but you will never regret after purchasing the replica. 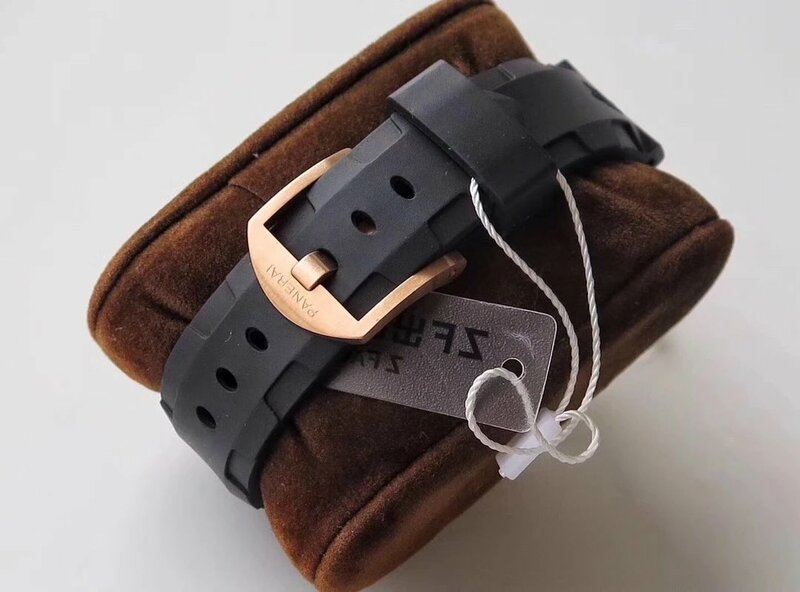 The case is measured to be in size of 42mm*11mm. 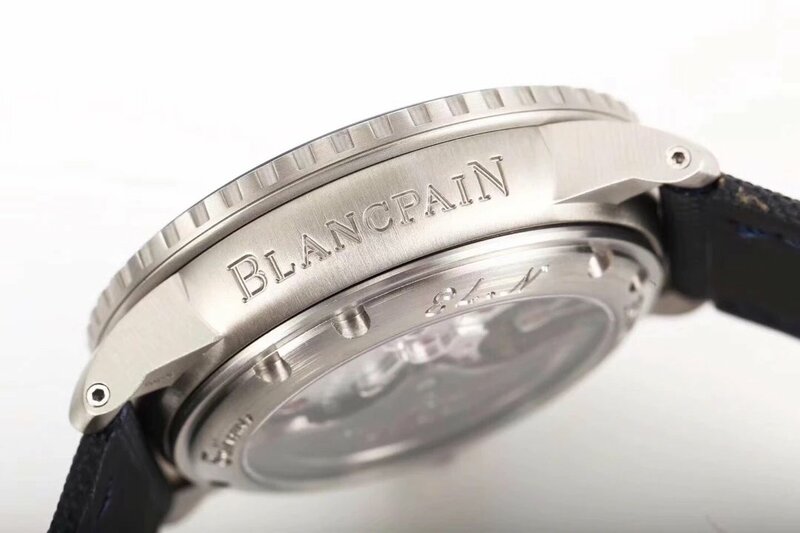 Round case has a black rotating bezel with white diving engravings. 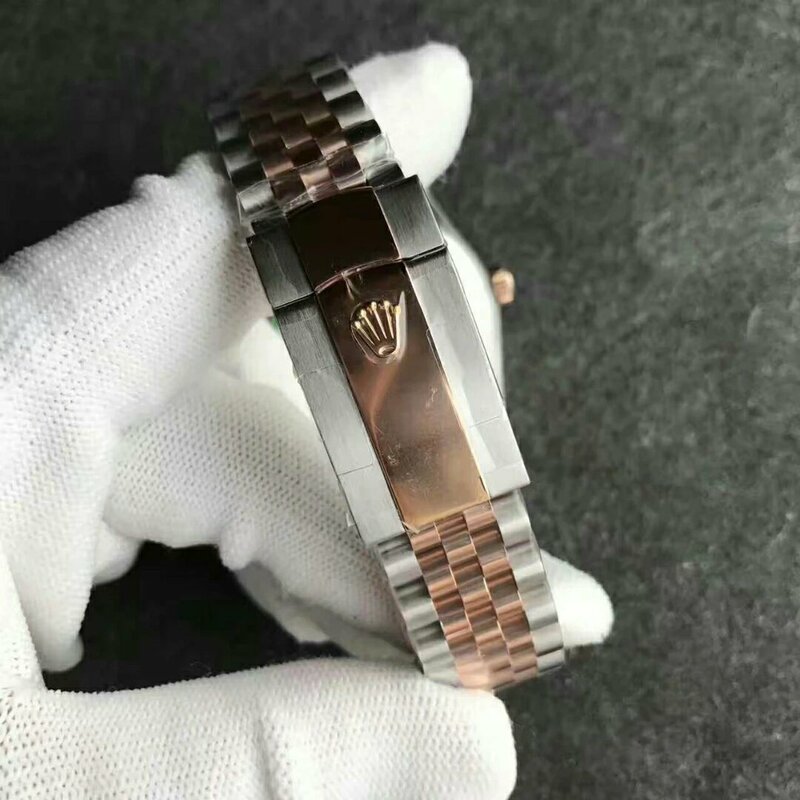 The case is made of 316L stainless steel and then has 18K rose gold coating plated. Whole case is brushed. 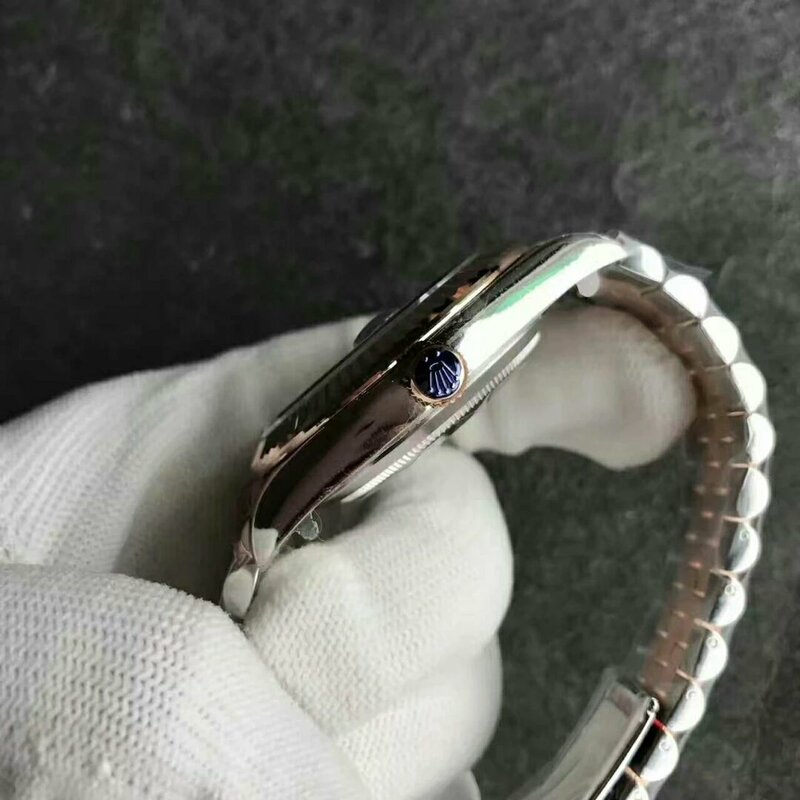 Crown is protected by two guards and has one blue sapphire embeded. 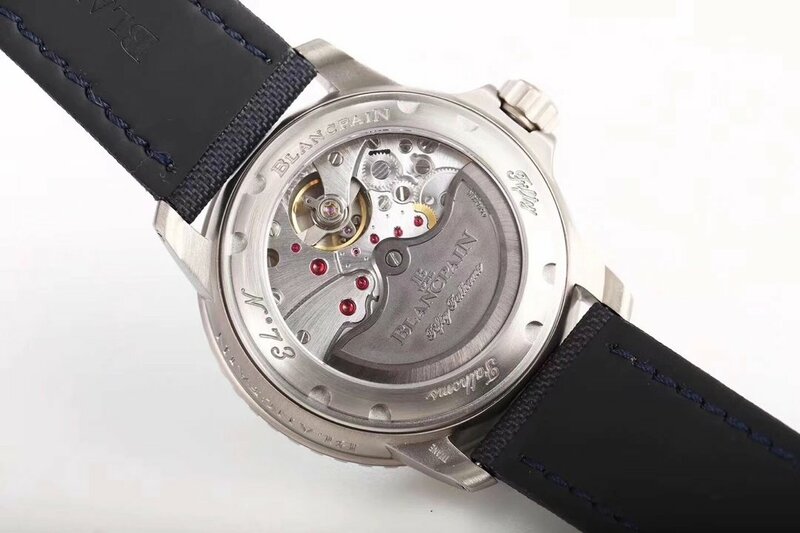 Case back is fixed by eight screws, there are engravings of “CALIBRE DE CARTITER”, “300M” and “DIVER’S WATCH”. 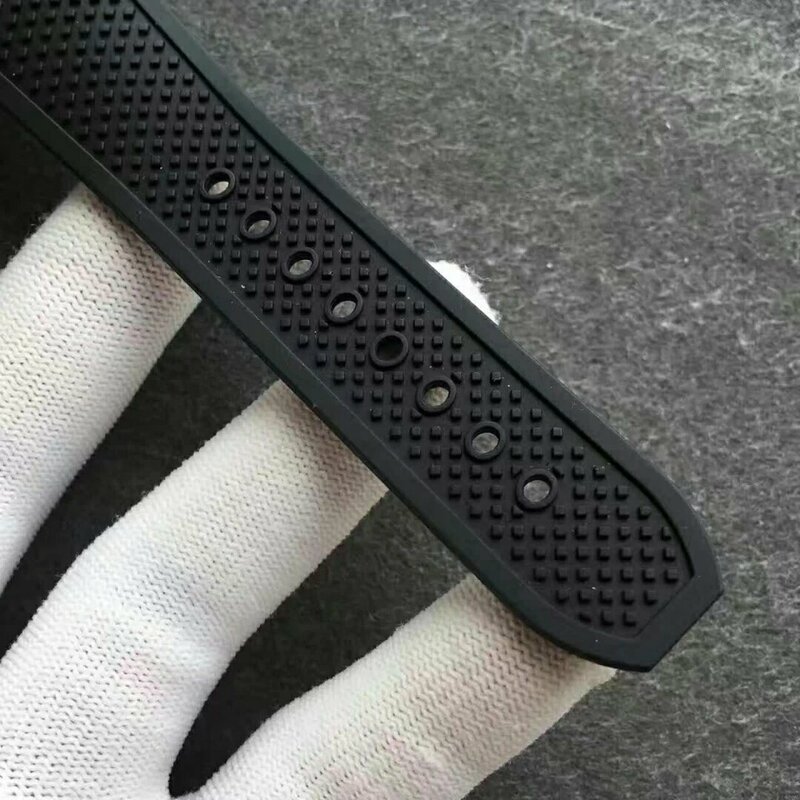 Dial is in black. White Rome hour markers are easy to read even in a dark place. 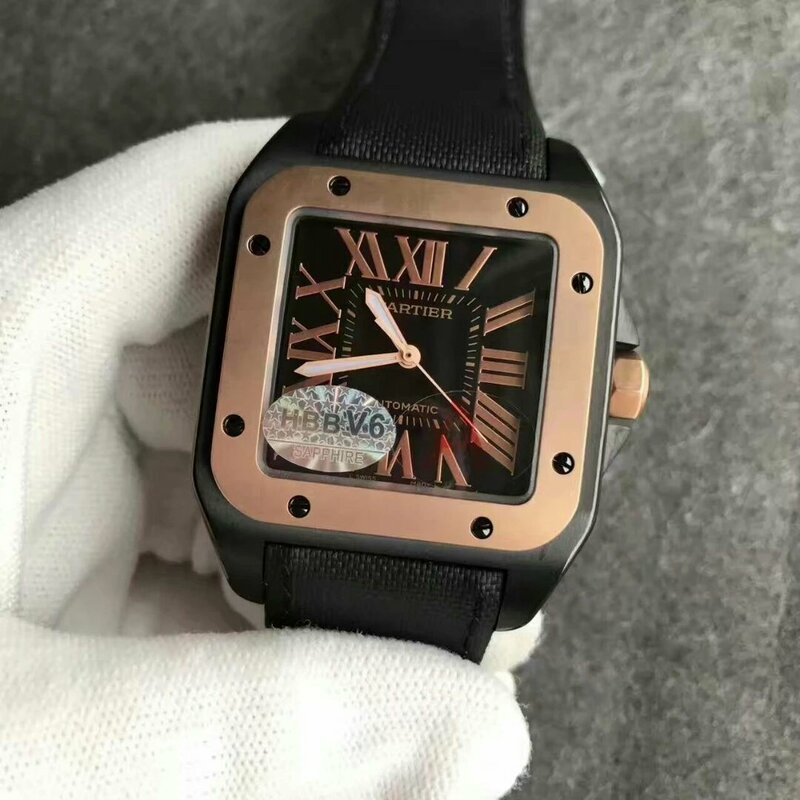 The big “XII” marker at 12:00 is applied with white luminescence, which will emit green light in the dark, three hands(small second hand included) are also applied with lume material. You will find the lume effect is amazing when reading time at night. 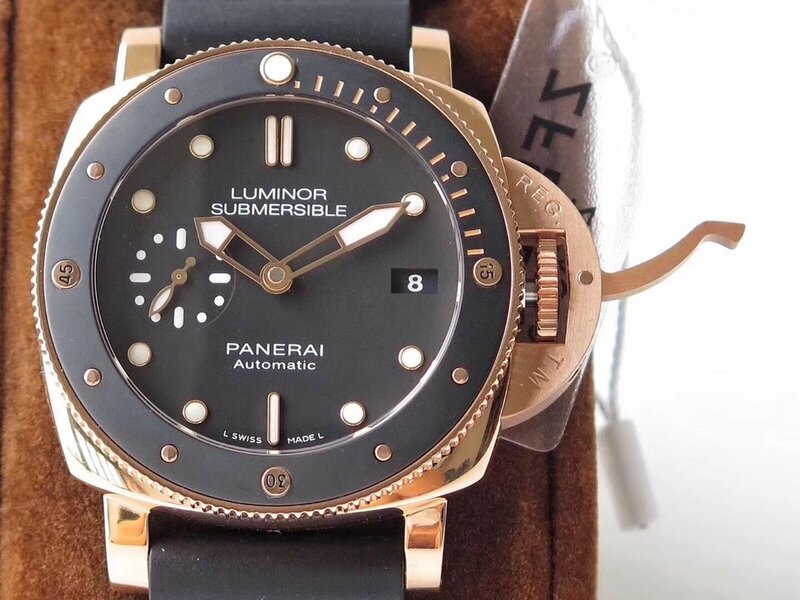 A big subdial is positioned at 6:00, the small second hand runs smoothly without jumping second. 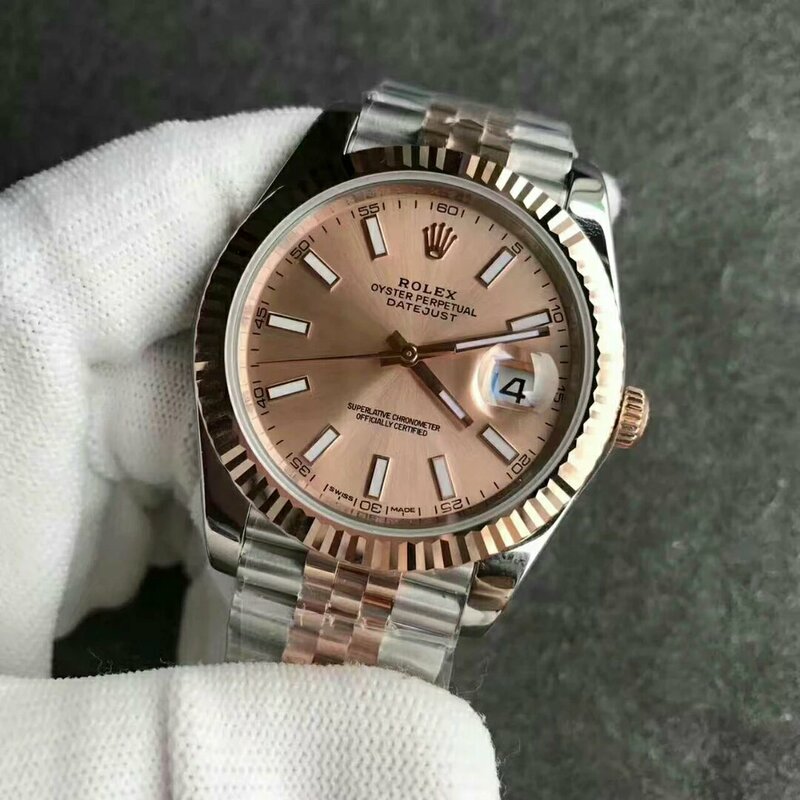 About the fan-shaped date window at 3:00, I think it is too big and makes the dial look crowded, it is only necessary to show current date, the previous and future date are not essential to be displayed in this window. 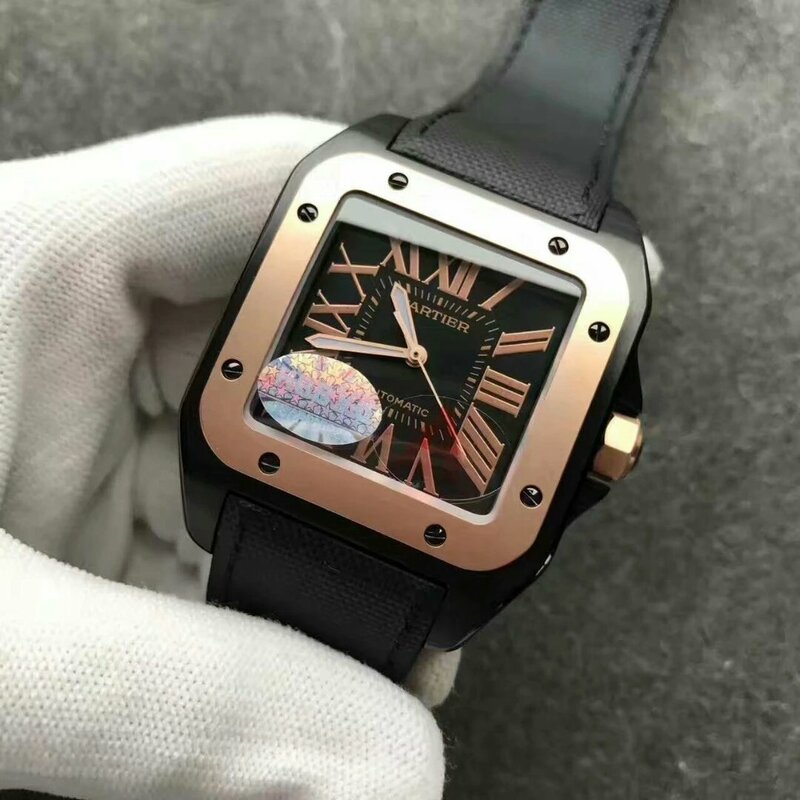 How do you think of this replica watch? Just leave your opinion below. Do not forget to send me an email message if you are interested in purchasing one. 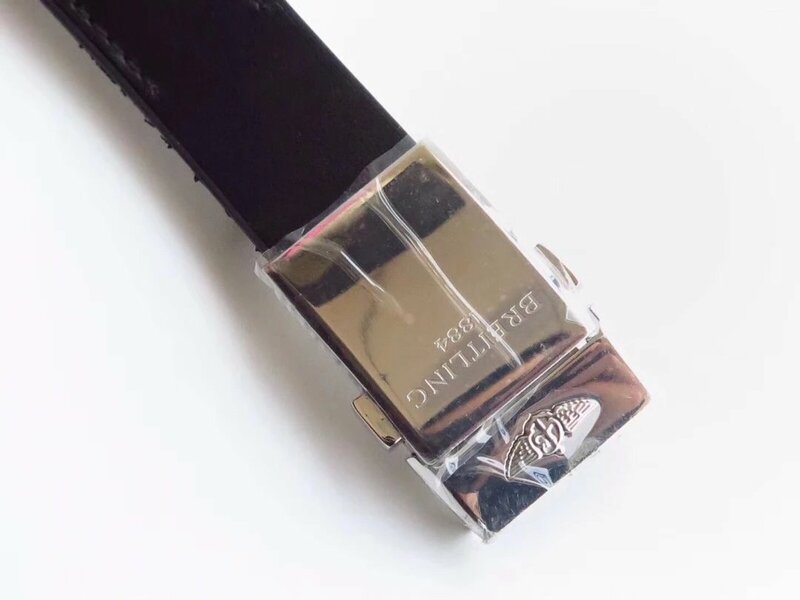 The sticker on crystal already shows its factory name of the replica, yes, it is made by HBB V6 factory, we also call it V6, now most people call it VS. 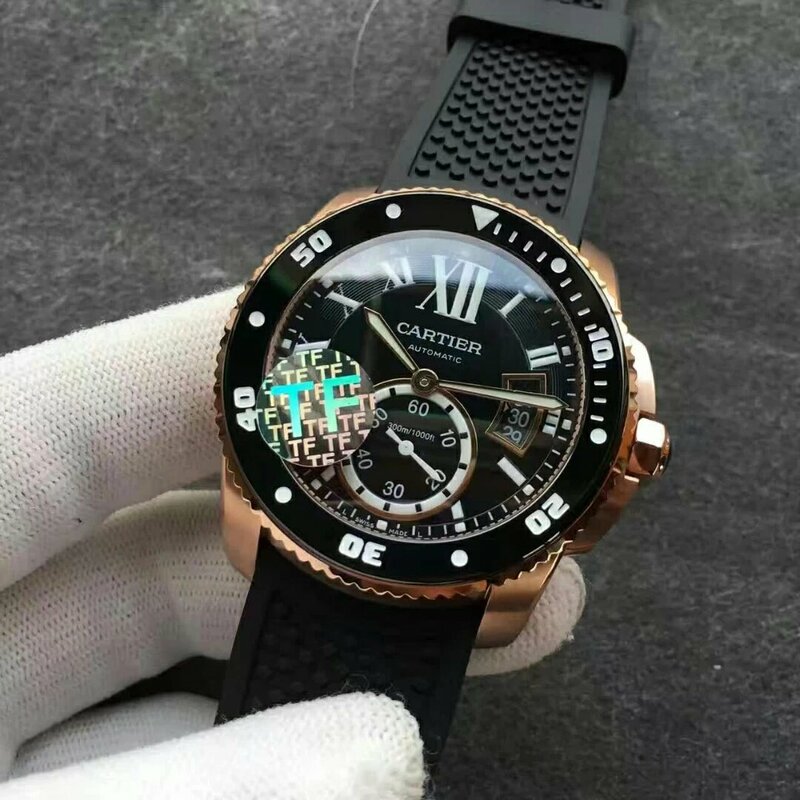 I seldom reviewed Santos watches of Cartier because their Ballon Bleu series is loved more by watch fans. 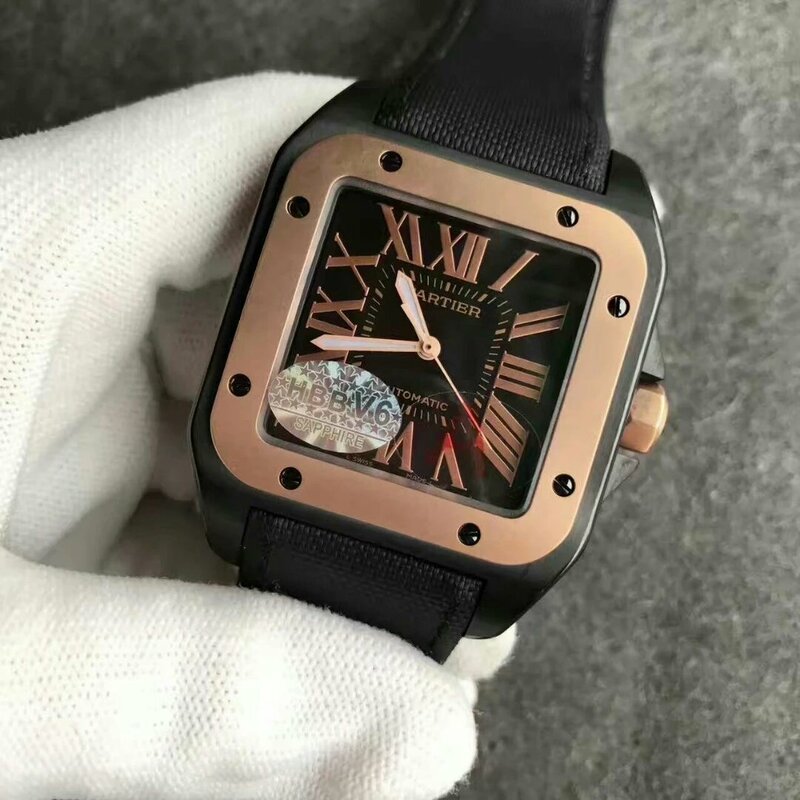 So on my blog, there are several excellent reviews about Cartier Ballon Bleu men and 28mm ladies watches, but currently no review on replica Santos 100. 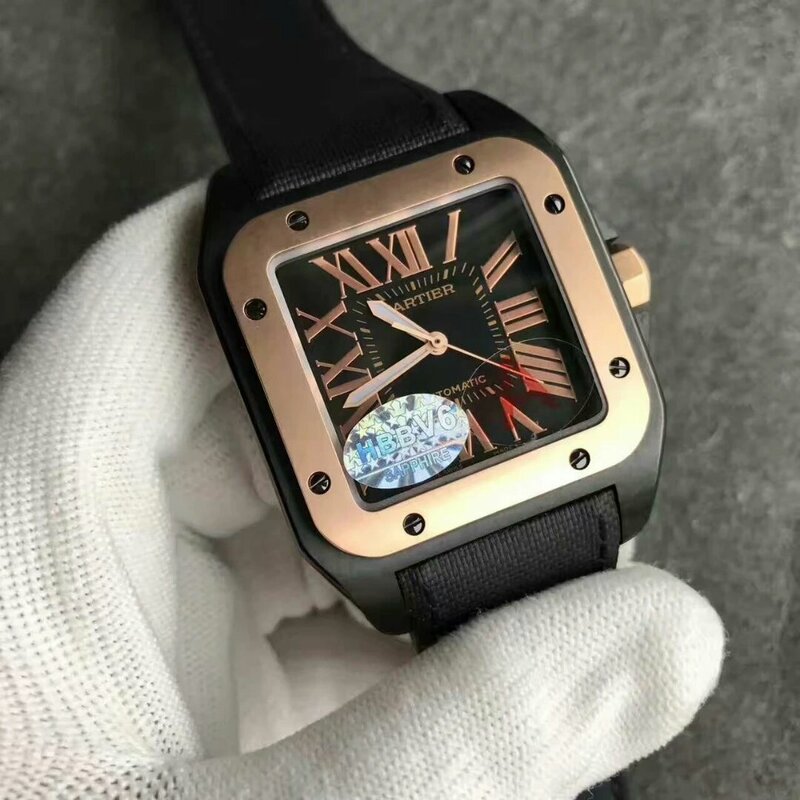 However, some models of Cartier Santos 100 were cloned perfectly by big factories, like this black and rose gold W2020009. 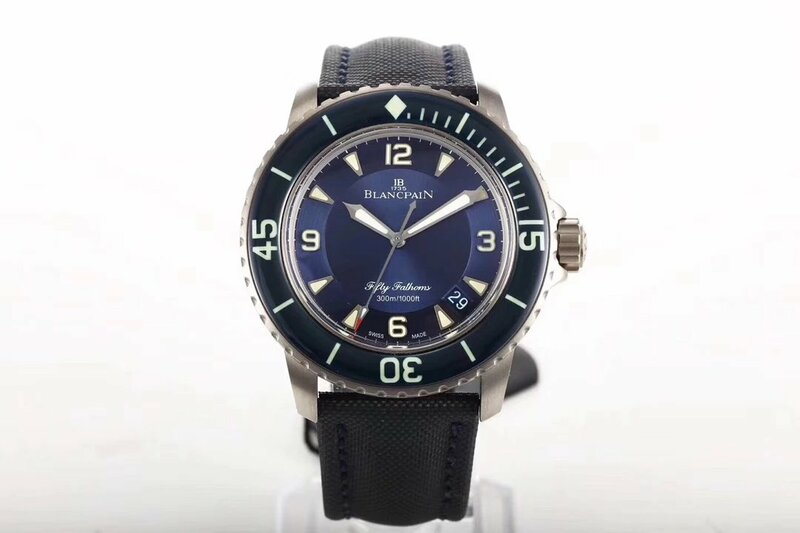 Not only the watch has a well finished case and good imitation dial, it is also equipped with an original Swiss ETA 2892, these are the reason why this replica is sold at a high price. 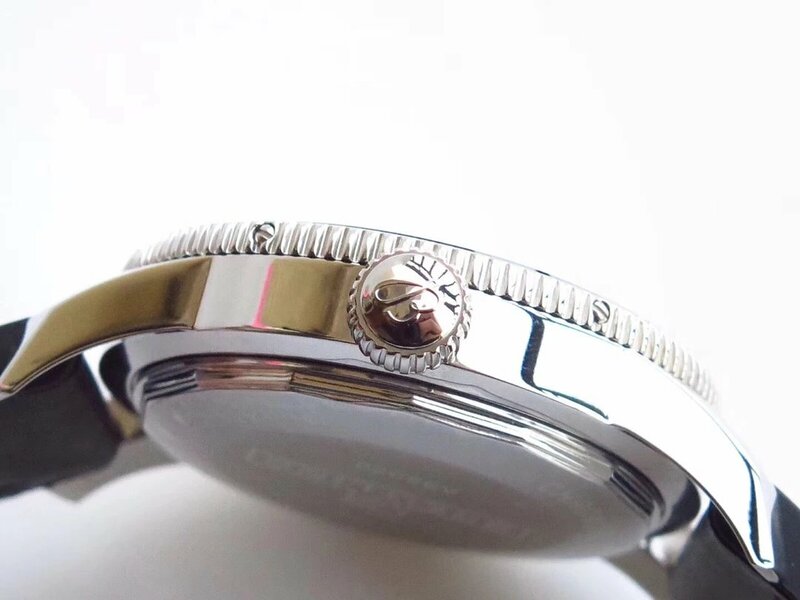 The case is measured to be 41mm in diameter, if the crown is included, it will be 44mm. 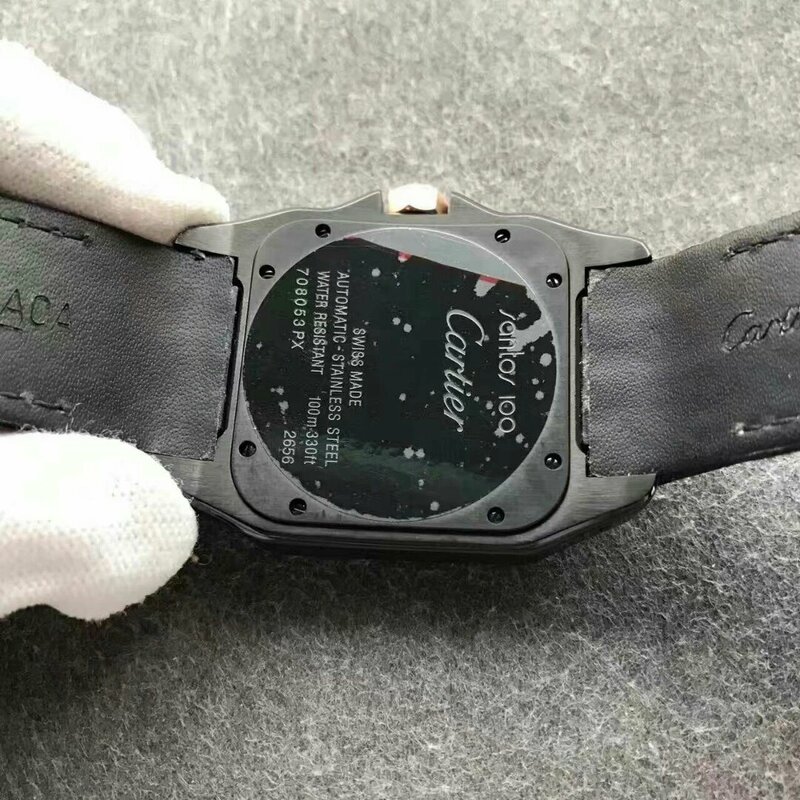 Case is blackened, the inner material is 316L stainless steel, then the surface is black DLC processed. 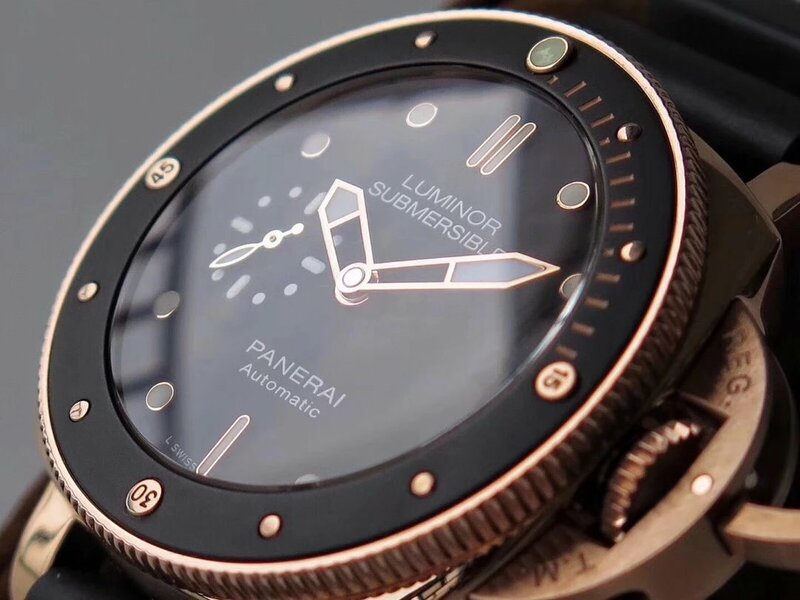 The bezel features a layer of 18k rose gold coating, there are eight blackened screws decoration. 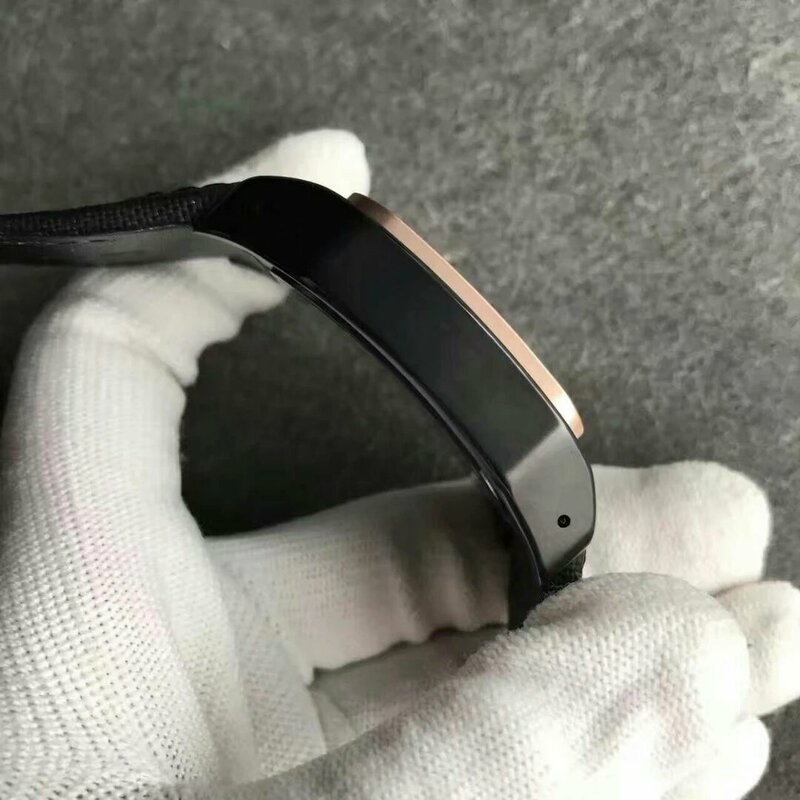 Rose gold crown also features a black cabochon ruby. 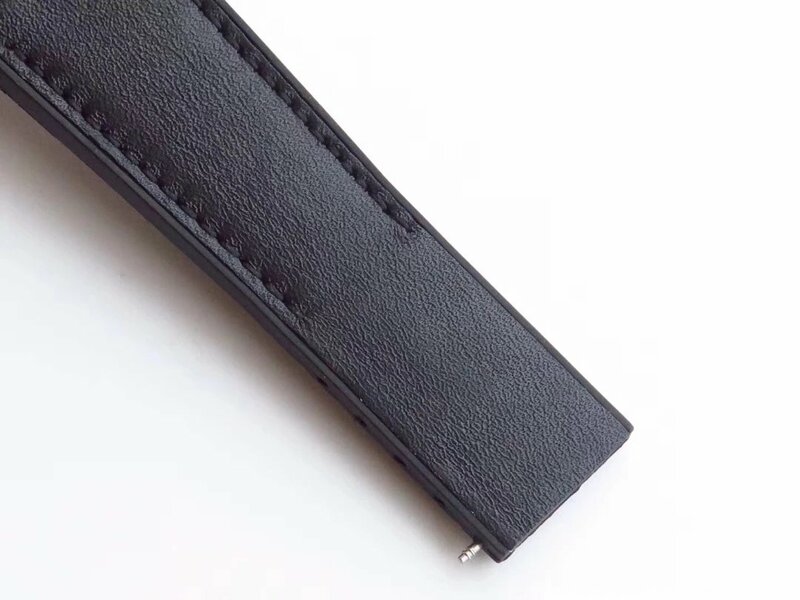 The lugs are designed to have some arc degree so that the whole case could fit your wrist perfectly. 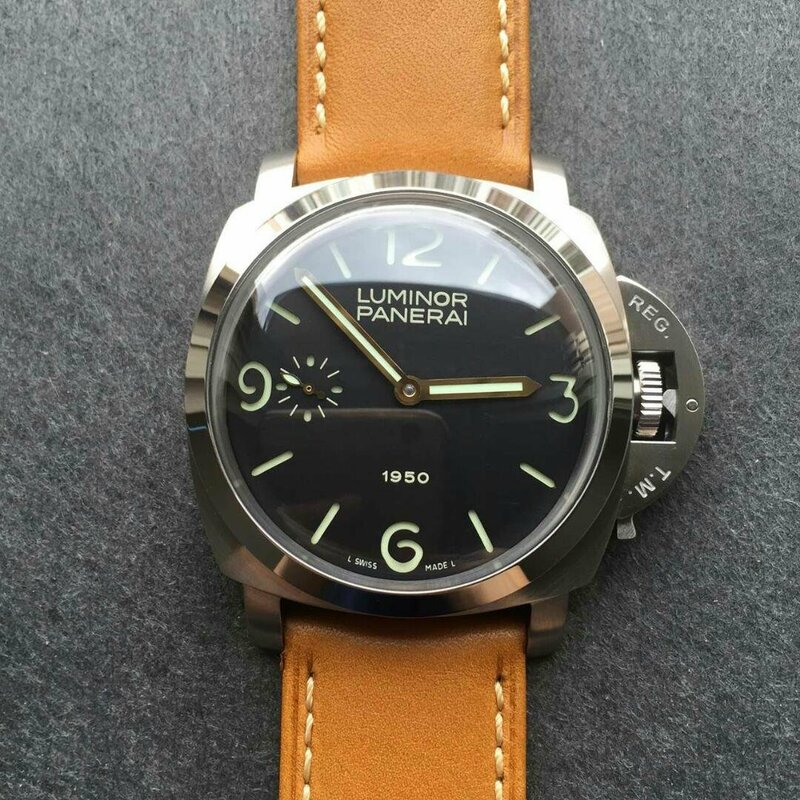 Dial is simple, with strong and wide case frame, the dial does not look that large like it should be. 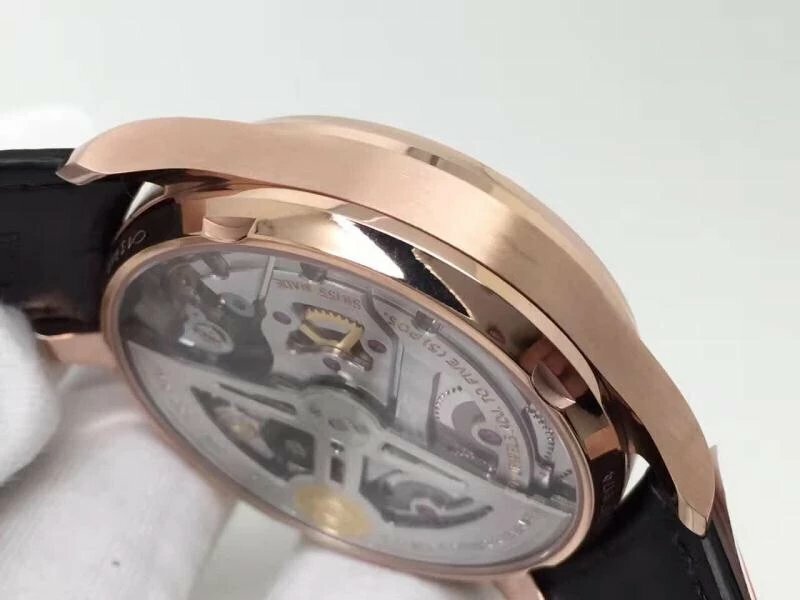 Minute markers are read from the central square subdial, the outer large Rome hour markers are in rose gold. 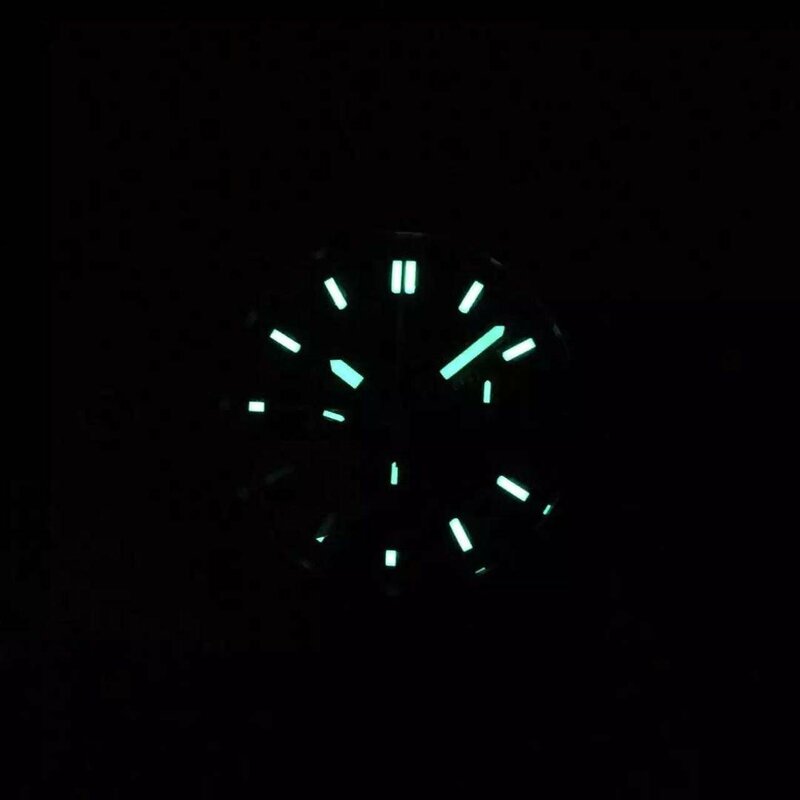 Only hour and minute hands are applied white lume material. 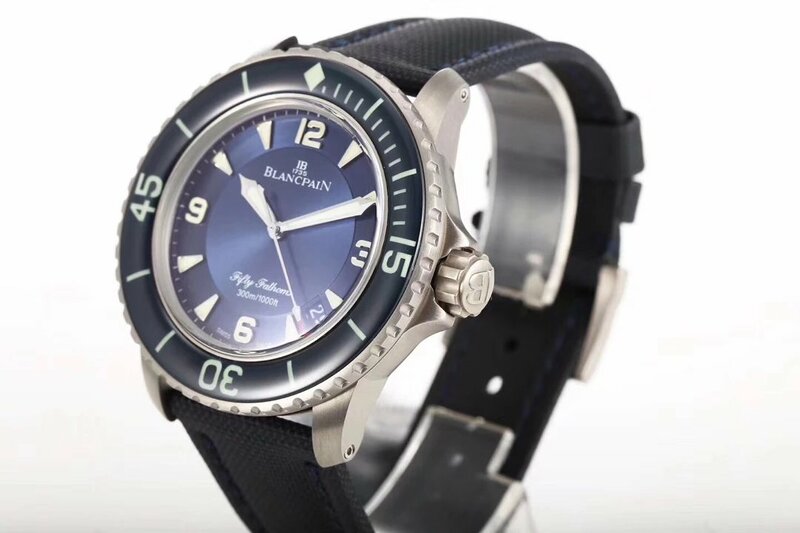 There are no extra decoration on the dial and it is hard for a watch expert to tell the dial difference between this replica and a genuine, because the dial is 100% replicated from an original. 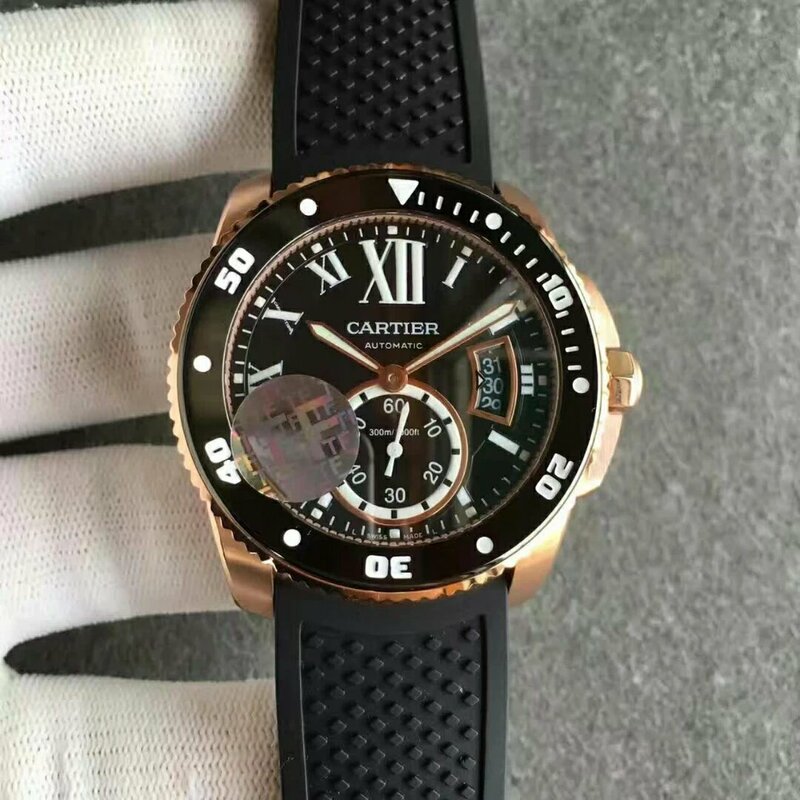 The replica Cartier is equipped with genuine Swiss ETA 2892 movement, which beats 28800 times per hour, the movement is durable and you can hardly see it is used in other replica watches. 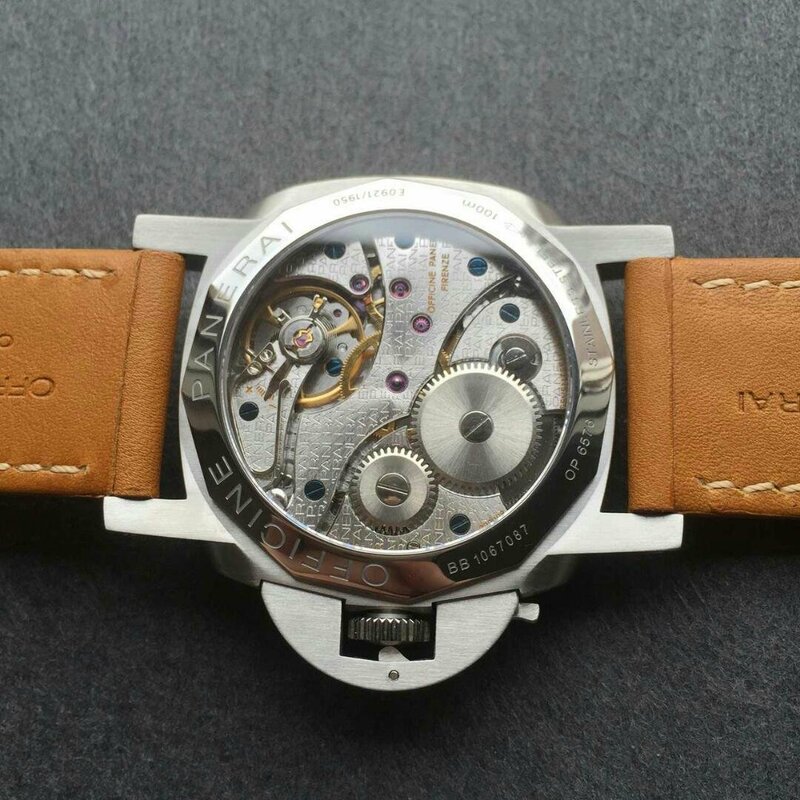 The factory also offers a clone ETA movement version, while makes this replica much cheaper.